Our best wishes for the Holiday Season. This is our last full post for 2017. We expect to provide a concluding update just prior to the New Year. The Esplanade on a cold December day, with sidewalk work halted due to weather. 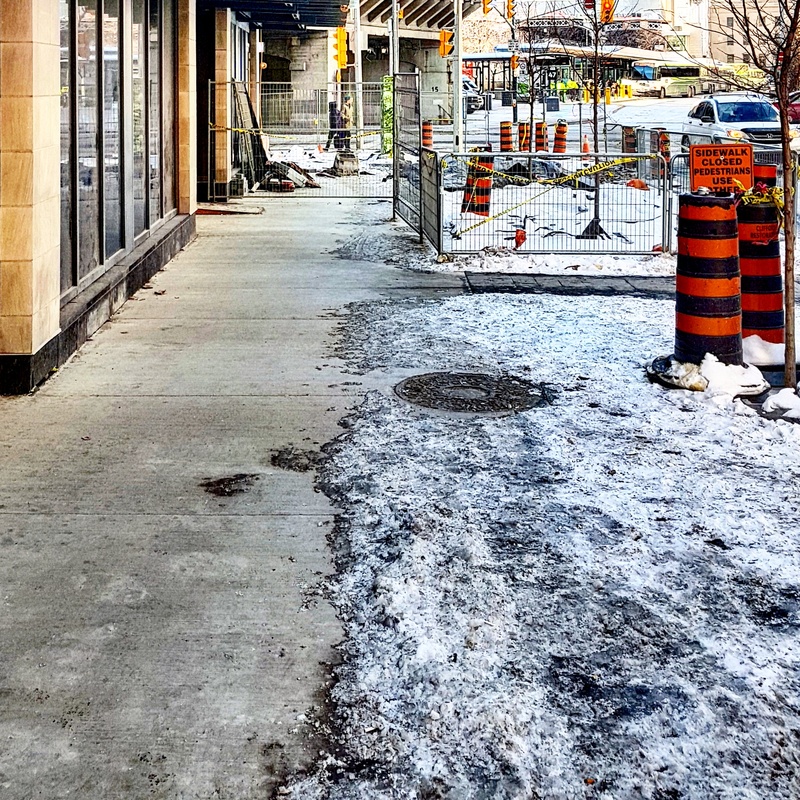 Work on the sidewalk is nearing completion along the south side of The Esplanade but recent cold weather has slowed its progress. This week crews, with the expected milder temperatures, work crews will resume work. It is hoped that the sidewalk pavers can be completed to The Esplanade as soon as possible. Work on the front entranceway to Backstage may take longer, given the uncertainties of the weather. 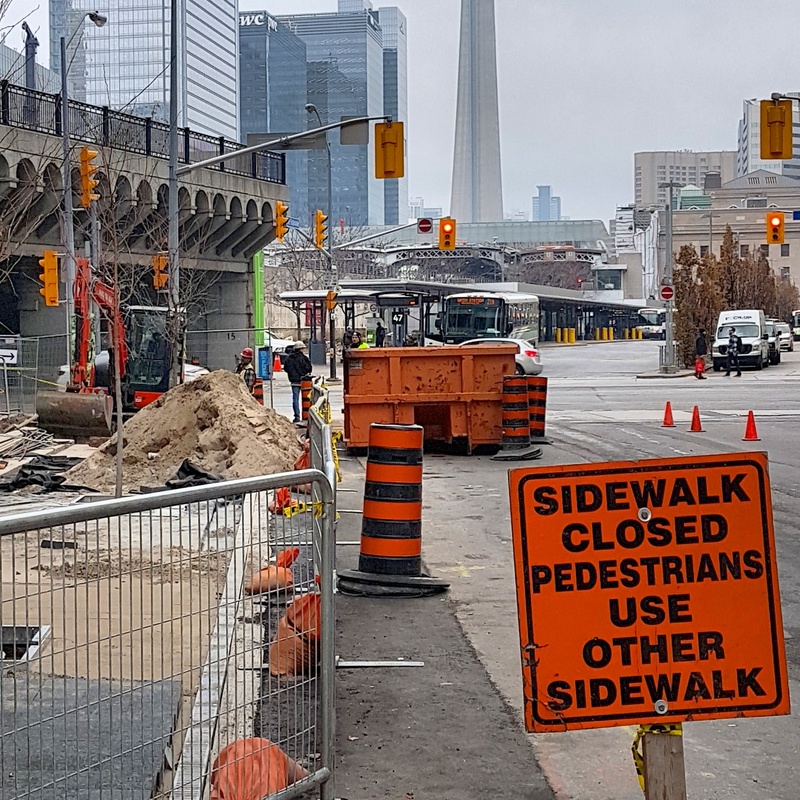 Weather permitting, work will aim to finish the sidewalk to Yonge Street this week. The completed concrete section of the sidewalk at Backstage. 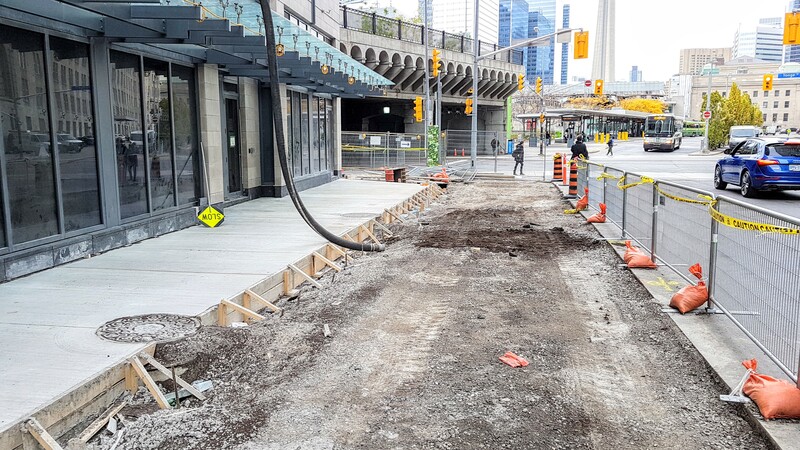 Work on the interior of the future PATH connection and Public Exhibit Space has made signiifcant progress in the first half of this month. Insulation has been installed. 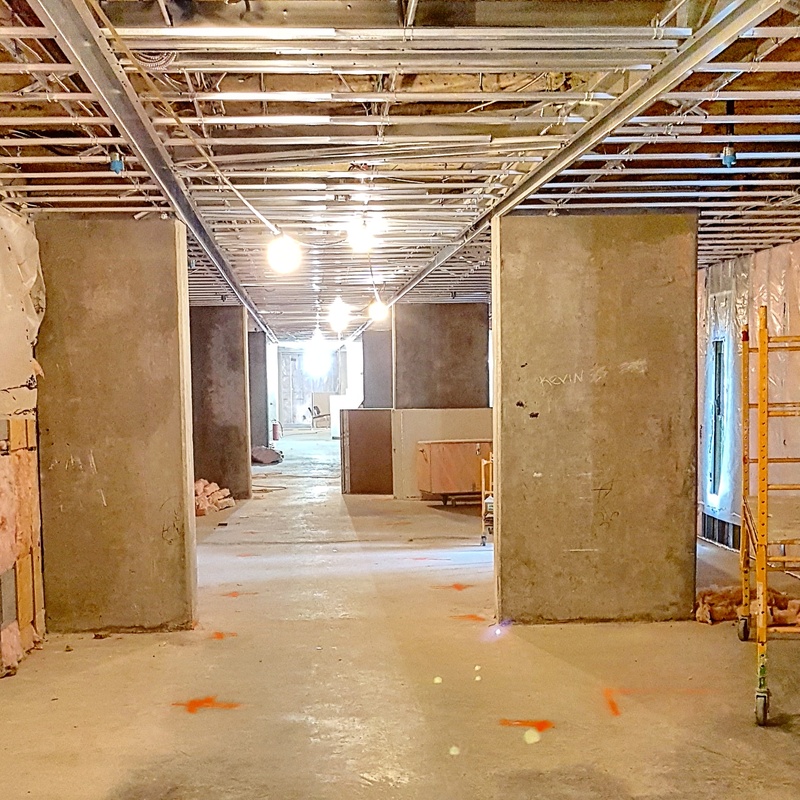 Drywall work is well advanced in the PATH and underway in the future Public Exhibit Space. 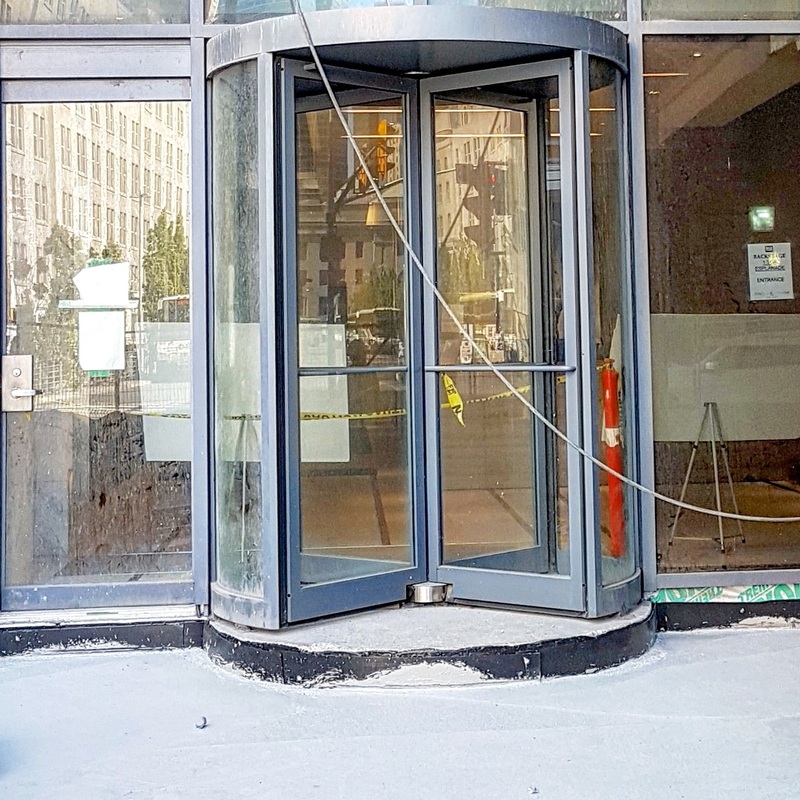 The stairway to the ground floor public lobby area has been installed. Concrete will be poured into the steps in the coming weeks. Lighting fixtures will also begin to be installed in the next few weeks. 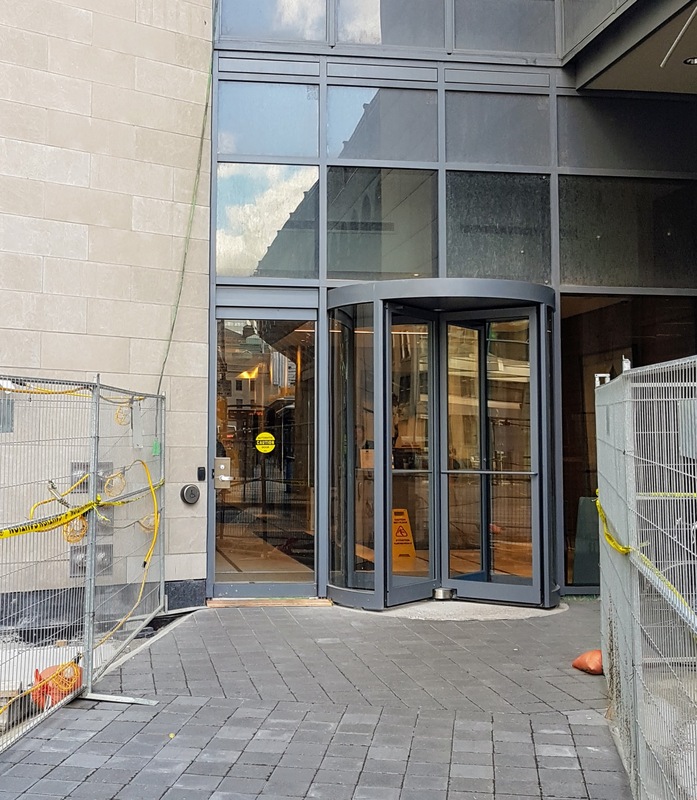 An elevator has already been installed that will serve the PATH and Public Exhibit Space, which is expected to open in 2018. The interior section of the future PATH as insulation and drywall work comes closer to completion. 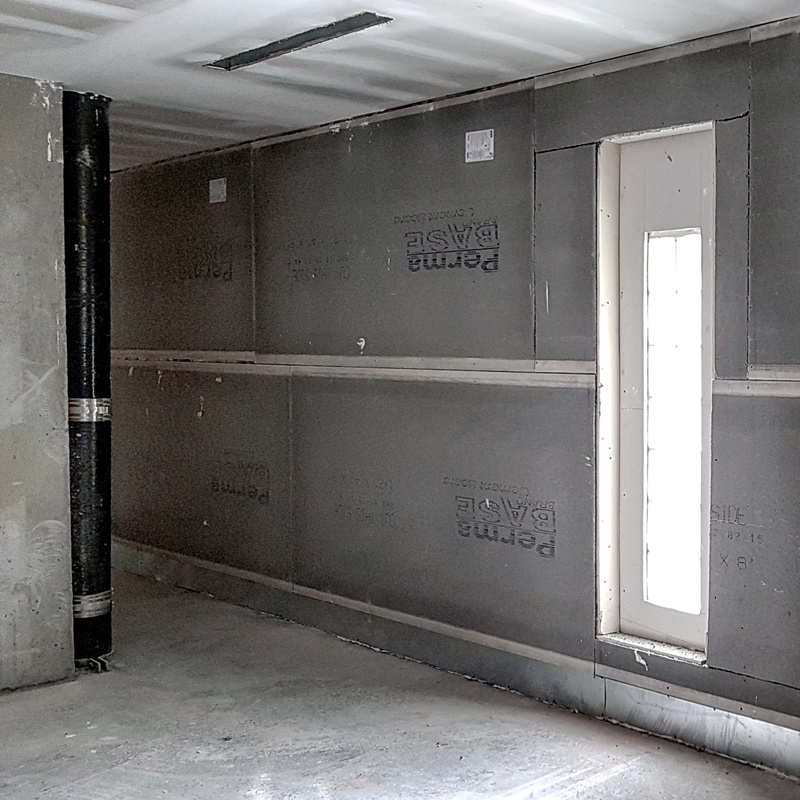 The interior of the future PATH showing the south wall with completed insulation. Stepping up to the future Public Exhibit Space and PATH. We will back just before the New Year with a wrap-up posting. Have a safe and happy Holiday Season. Work on the exterior of Backstage is very near complete, with the remaining focus being the finishing of the sidewalk along The Esplanade. 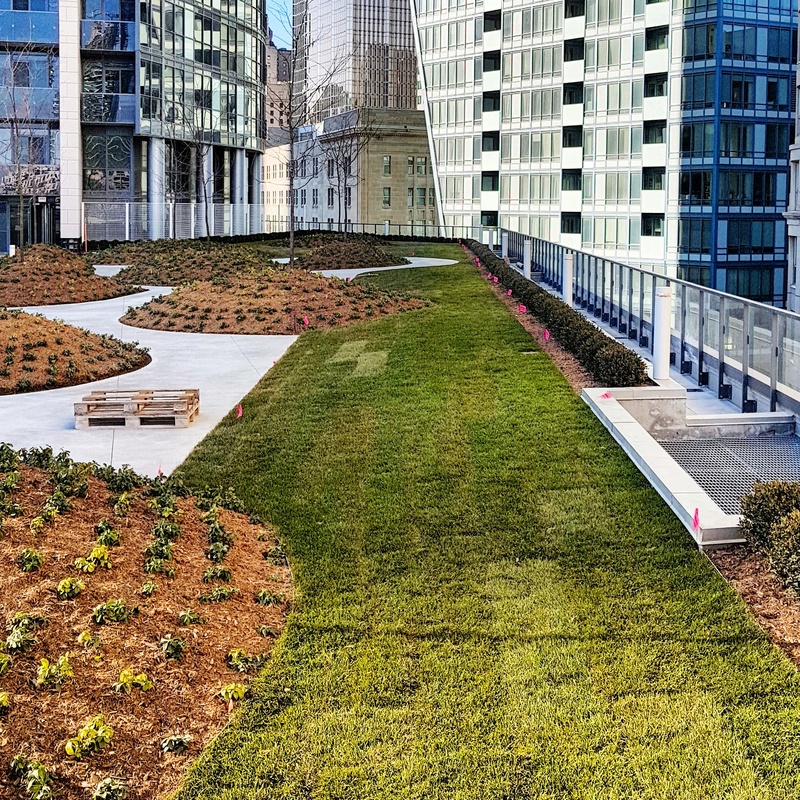 The completed outdoor amenity space at Backstage, looking west. 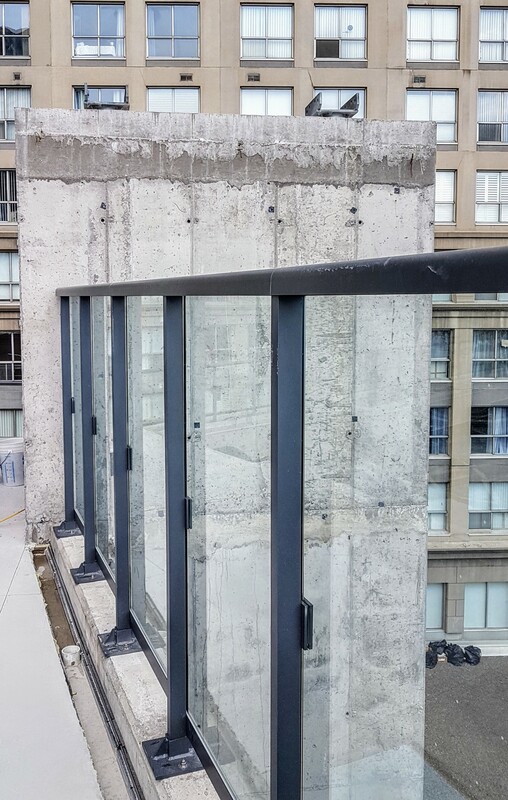 Exterior Work – Podium Deck. 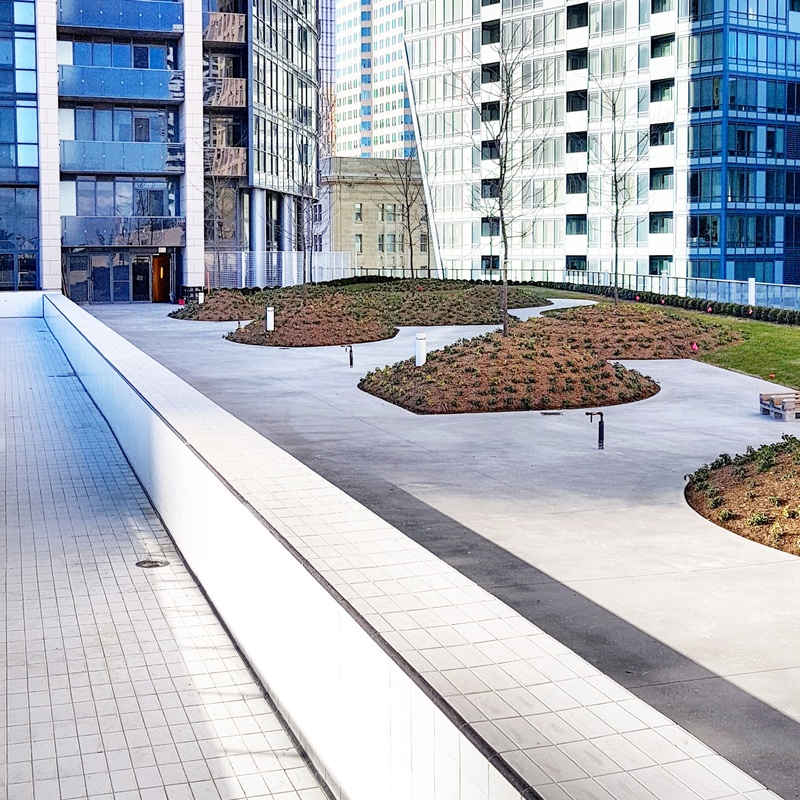 Landscaping and plantings for the outdoor amenity space on the podium deck are complete. Only barbecue fixtures and railing for the outdoor lap pool remain to be installed. 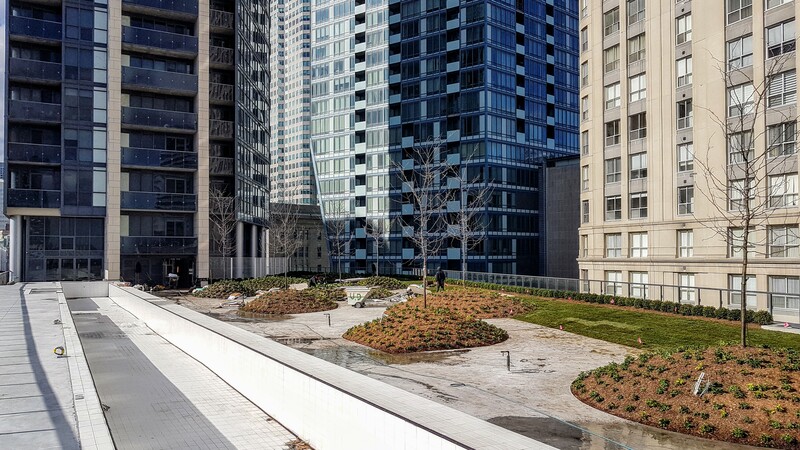 The landscaped outdoor amenity space looking east. 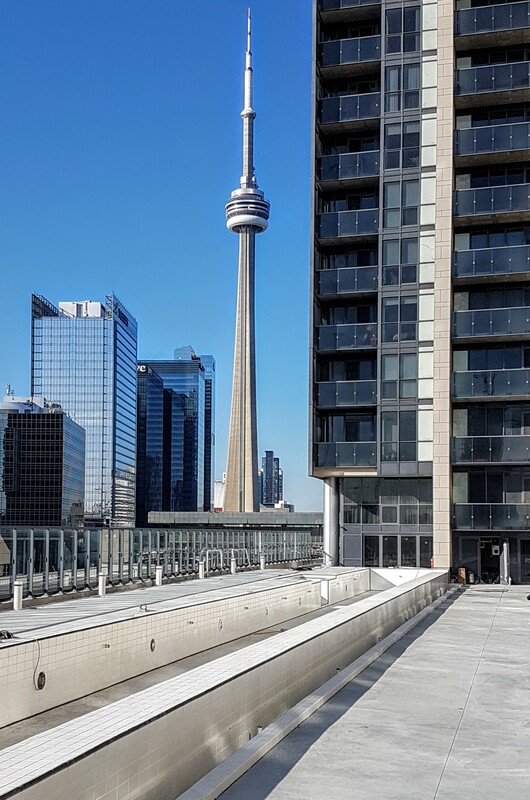 The outdoor amenity space looking northwest across to the pool to L Tower. Work on the sidewalk is nearing completion. 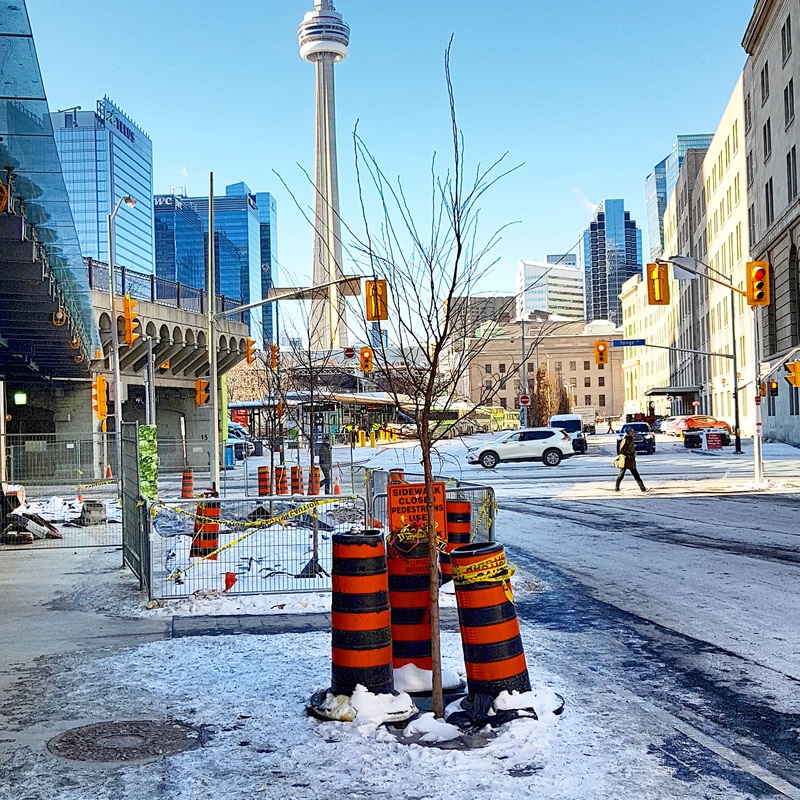 Trees have been installed along the sidewalk. 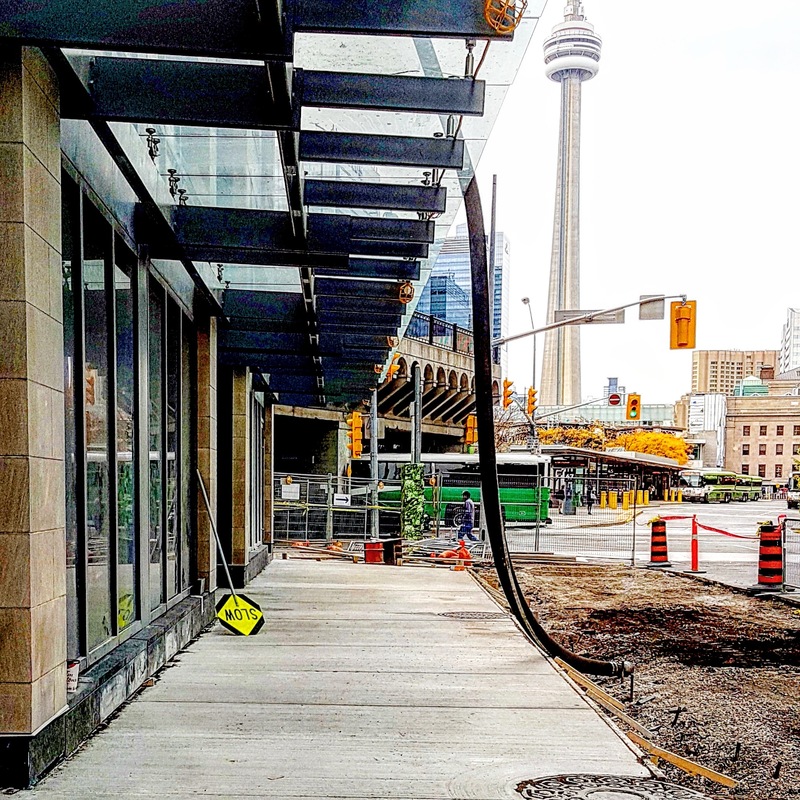 Granite pavers are being installed, mirroring the north side of The Esplanade along the frontage of the L Tower. Asphalt has been laid down to the curb edge. Noting that the whole roadway between Yonge and Scott is planned to be resurfaced next year after the winter. 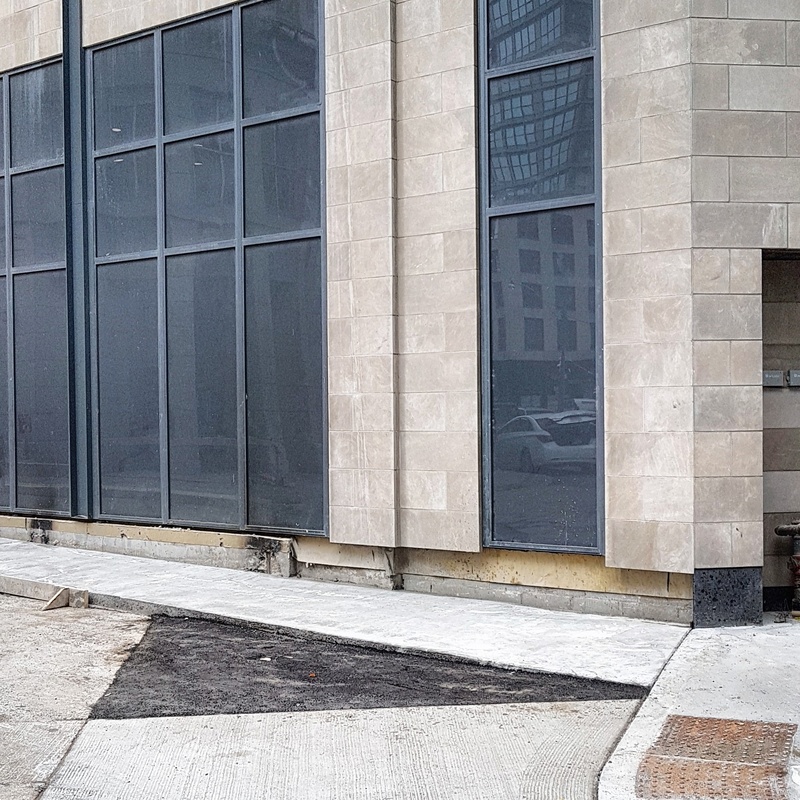 Granite paving stones being installed along The Esplanade frontage of Backstage. Asphalt has been filled in to the curb edge. The concrete and asphalt work is done at the entrance to the TPA Green P lot. 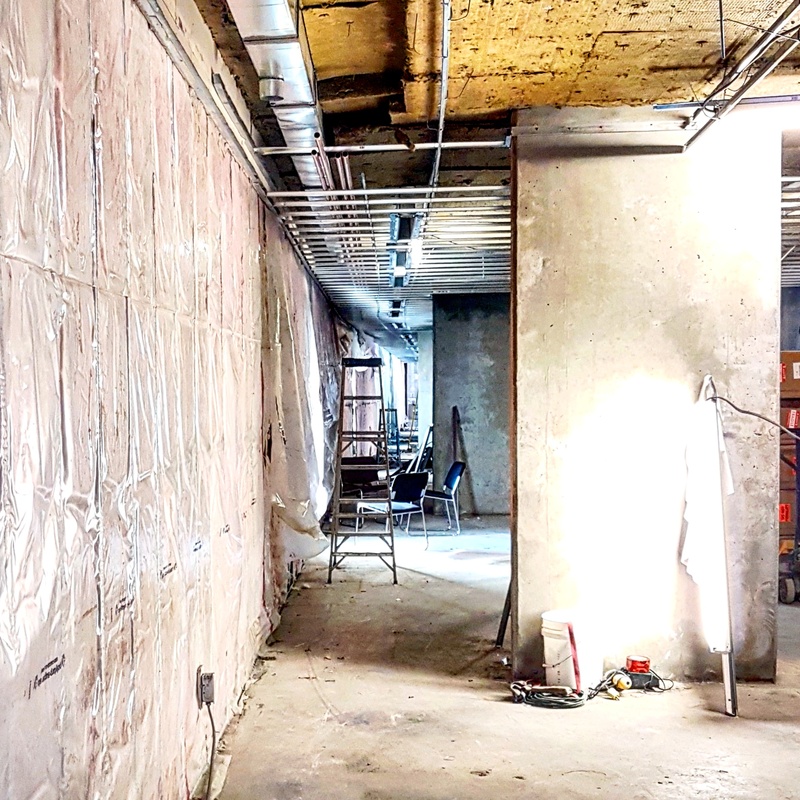 Work on the interior of the future PATH connection and Public Exhibit Space continues to make steady progress. Insulation has been installed. 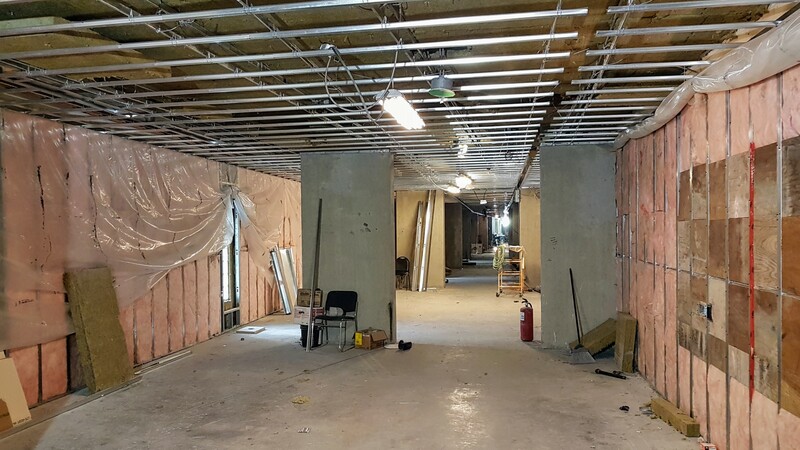 Work on the ceilings is underway and drywall work is about to begin on the interior walls. 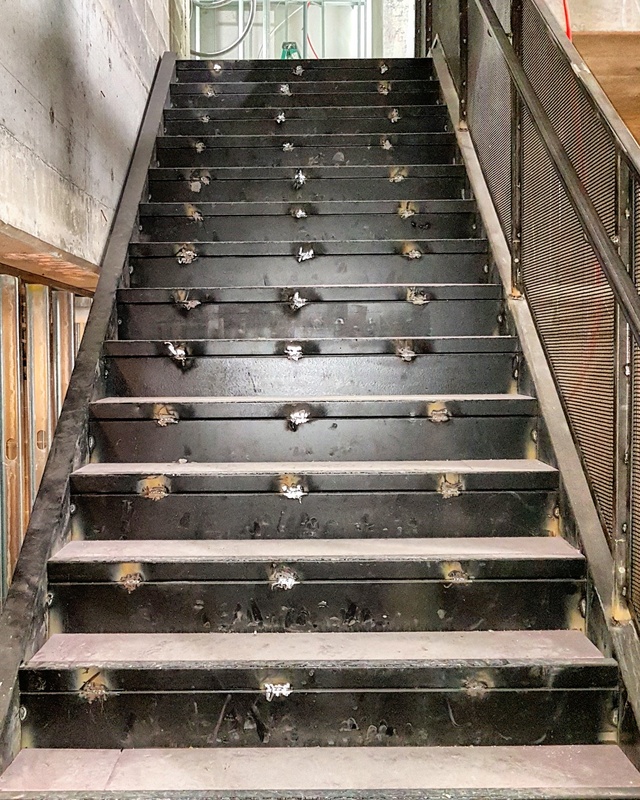 The staircase that will connect the main floor of the public lobby to the PATH and Public Exhibit Space has been installed and finishing work on it will continue this month. An elevator has been installed that will also serve the PATH. Work on the interior PATH is moving forward at a steady pace. 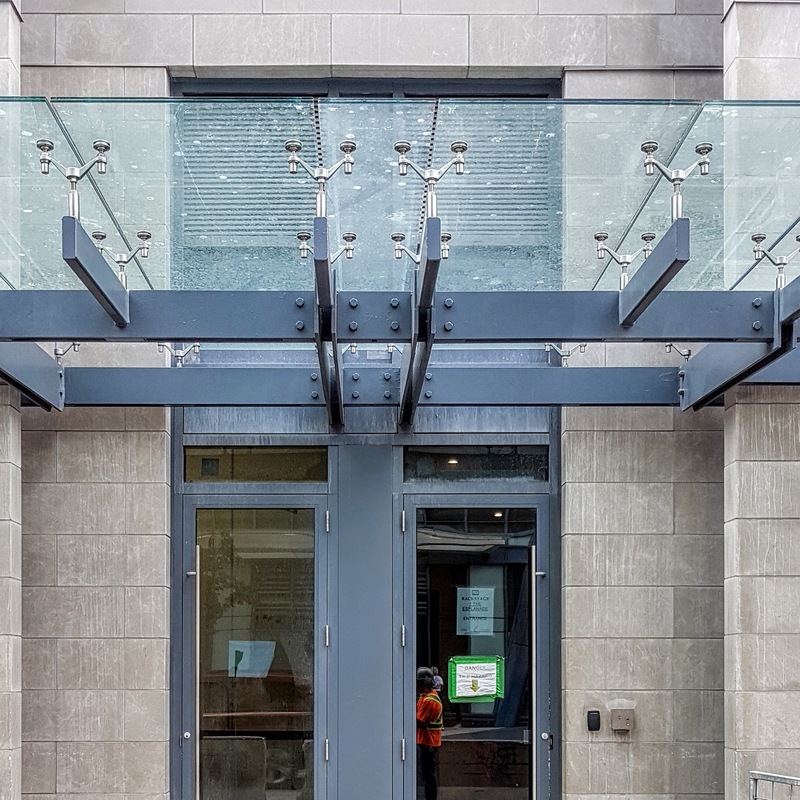 Staircase installed that leads from the public and retail entrance to the interior PATH. We will be continue to provide construction updates while exterior work remains to be completed. 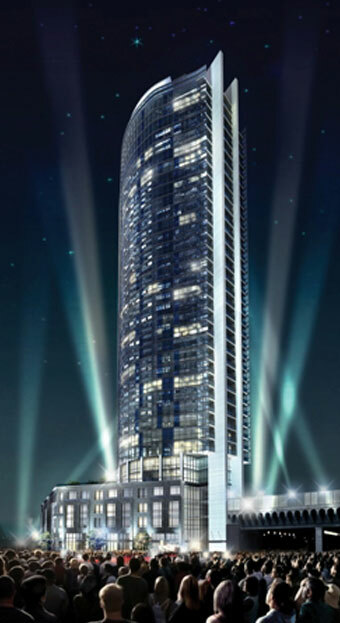 Please check back here at ltowerconstructioninfo.com for regular updates. 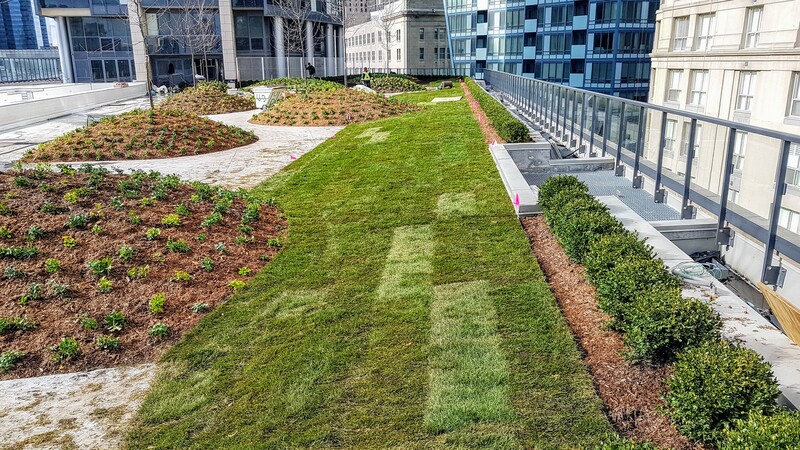 The curving path between the green lawn and tree plantings on the outdoor amenity space. NOTE: We will be posting major construction updates monthly, with other updates as developments warrant. 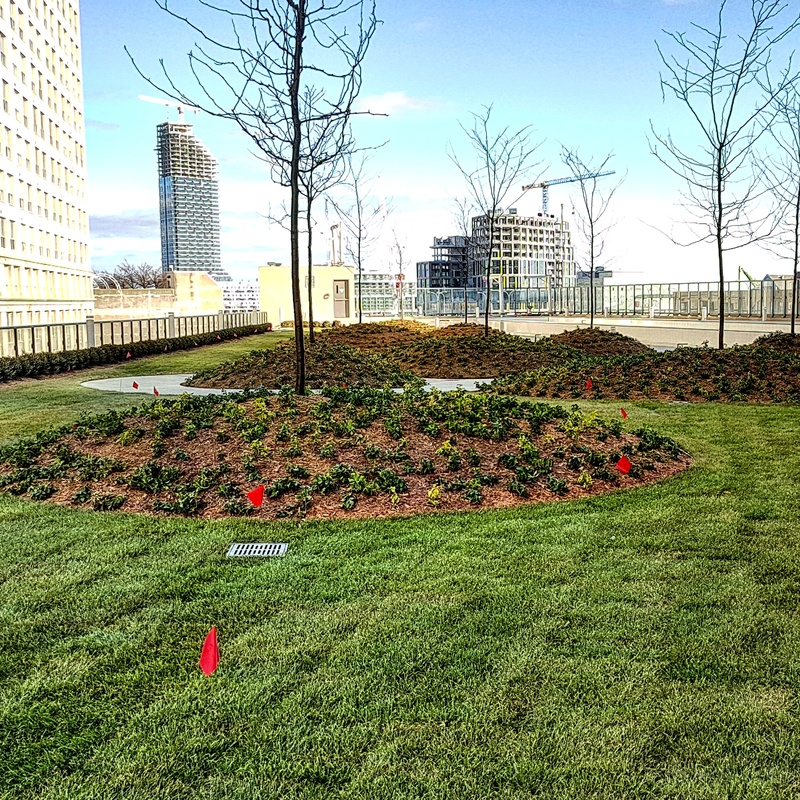 The outdoor amenity area plantings at Backstage. 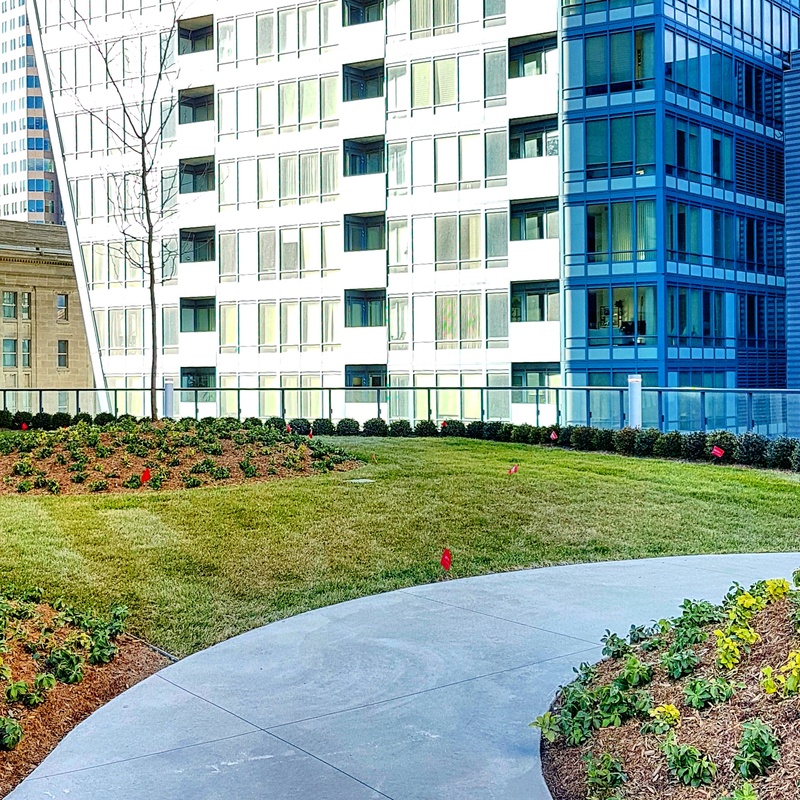 Landscaping and plantings are substantially complete, with some remaining work remaining on northwest corner of the outdoor amenity area. Barbecue fixtures will also be installed in the coming weeks. Tree and garden landscape elements on the outdoor amenity at Backstage. The finished lap pool on the outdoor amenity level at Backstage. Work on the first section of the sidewalk has been completed. 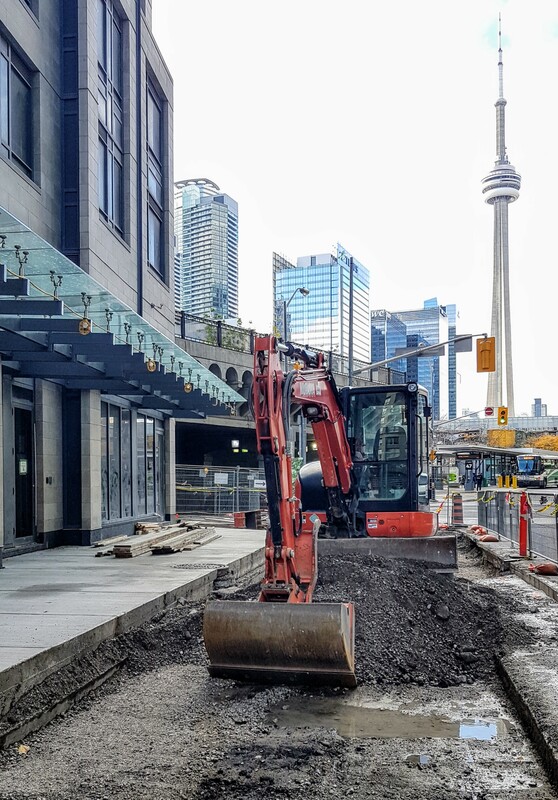 Work is now underway to excavate the area where trees will be planted and granite pavers installed, mirroring the north side of The Esplanade along the frontage of the L Tower. 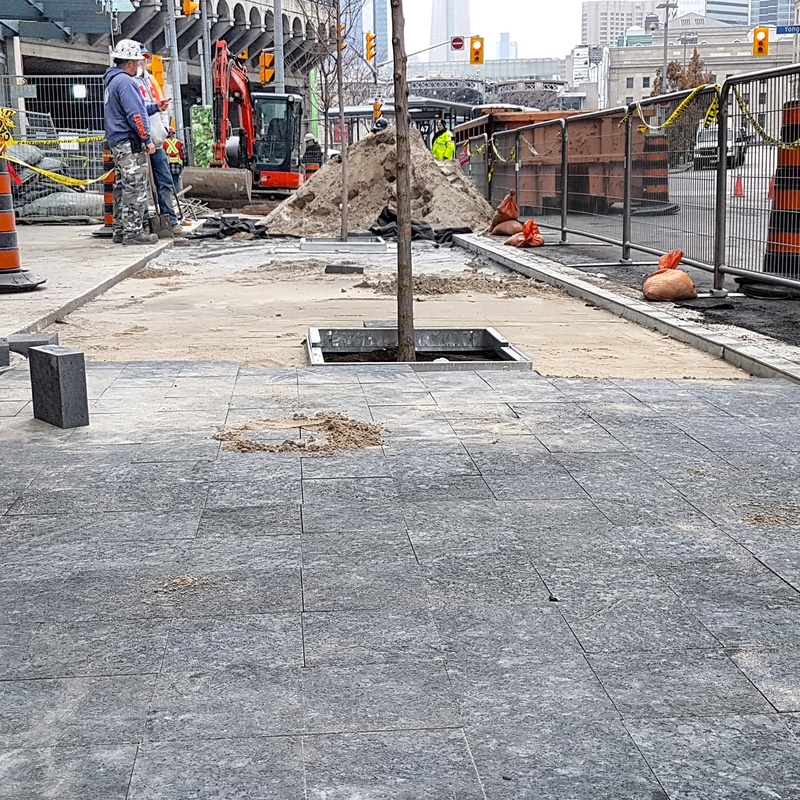 The temporary pavers leading to the main entrance to Backstage will also be replaced by granite pavers and concrete, once the work along the south side of The Esplanade is completed. Ongoing work at grade to prepare for tree planting and the installation of granite pavers. Excavating in advance of tree planting and the installation of granite pavers. The temporary paving stones at the Backstage front door will be replaced with granite pavers. Work on the interior of the future PATH connection and Public Exhibit Space is making steady progress. 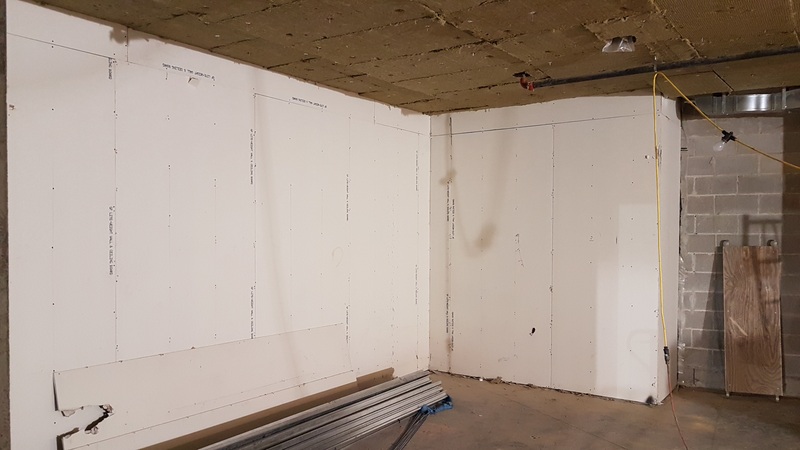 Most of the insulation and wall studs have been installed; drywall work will follow. 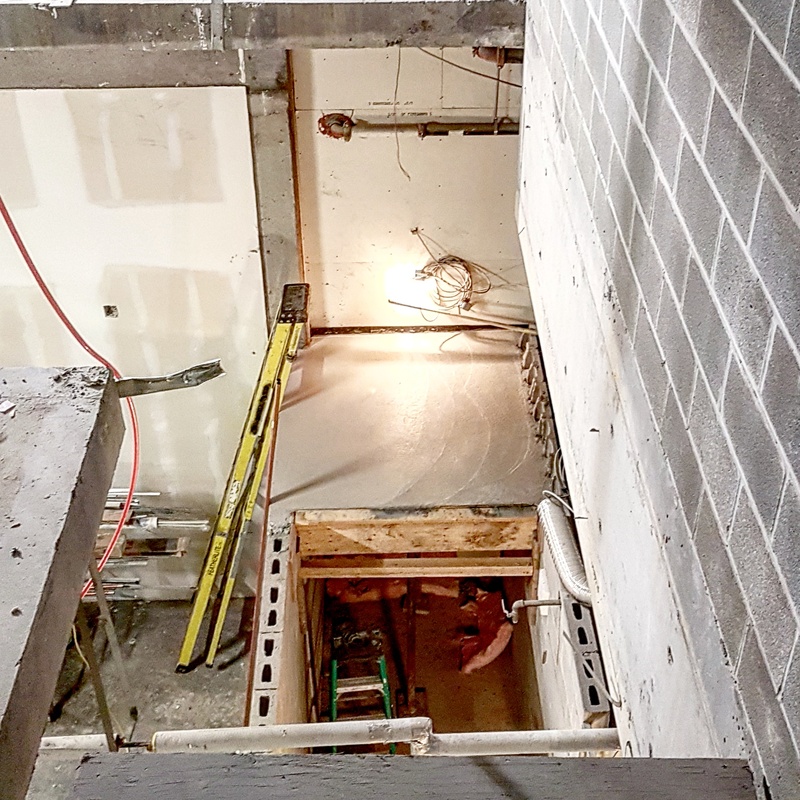 The stairwell that will connect the main floor of the public lobby to the PATH and Public Exhibit Space is also under construction. An elevator will also serve the PATH. Work ongoing on the future PATH on the 2nd level of the podium at Backstage. 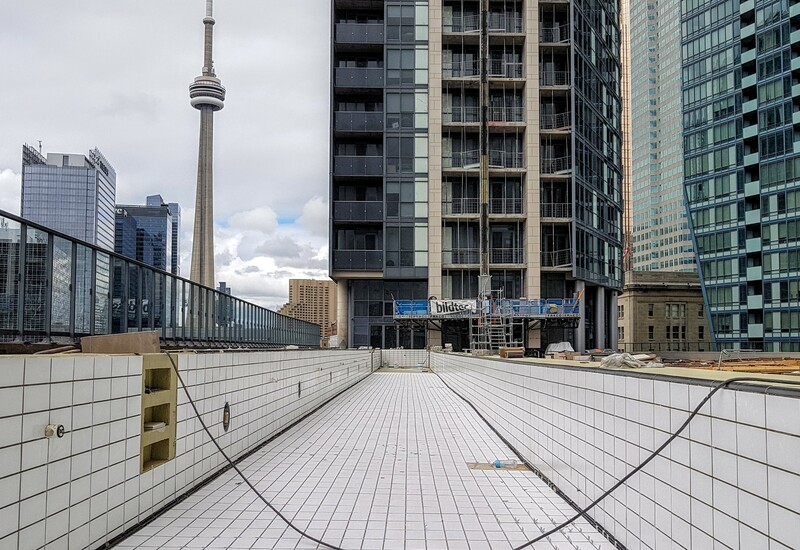 Looking north west across the outdoor amenity space at Backstage. South face of the Backstage tower. The outdoor pool has been completed. 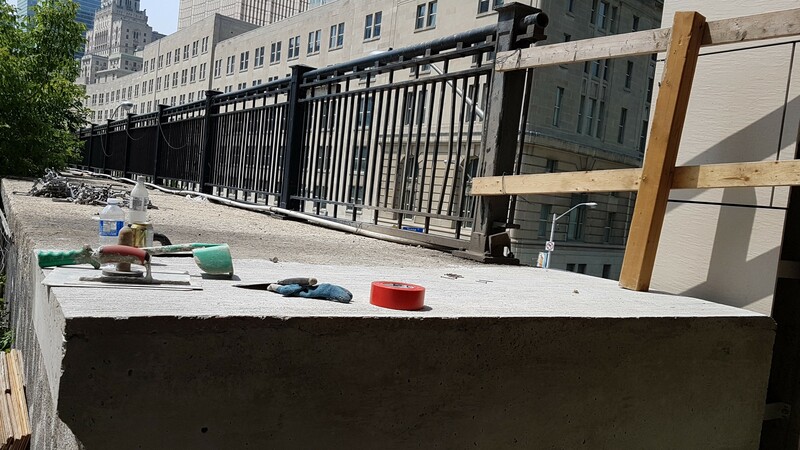 All the hard surface (concrete) has been completed on the podium deck. Landscaping and plantings is underway through the balance of the fall. Barbecue fixtures will also be installed. Concrete completed on the podium deck. Looking southwest from the podium deck. Work on the sidewalk has begun. 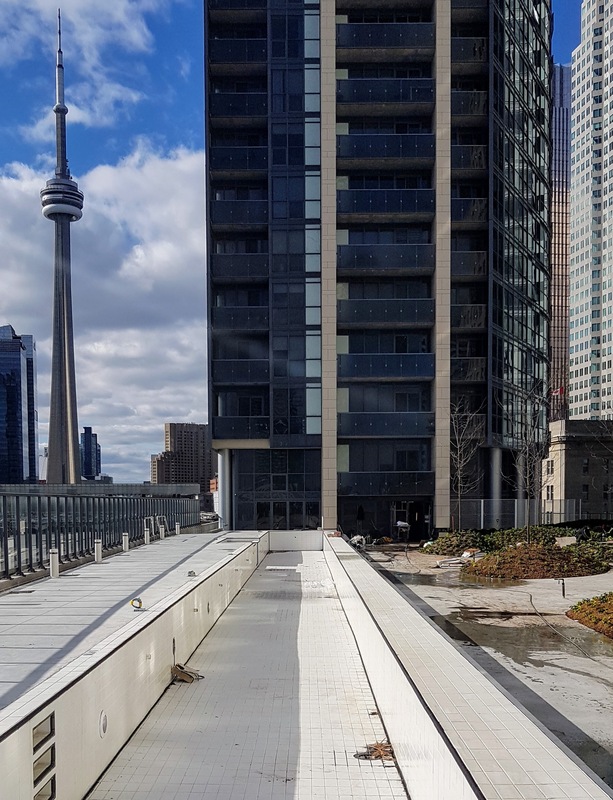 When completed the south side of The Esplanade will mirror the north side at the L Tower, with a mix of concrete and granite paving, long with tree planting. The first phase of the sidewalk work is completed. Work underway on the sidewalk area in front of Backstage. 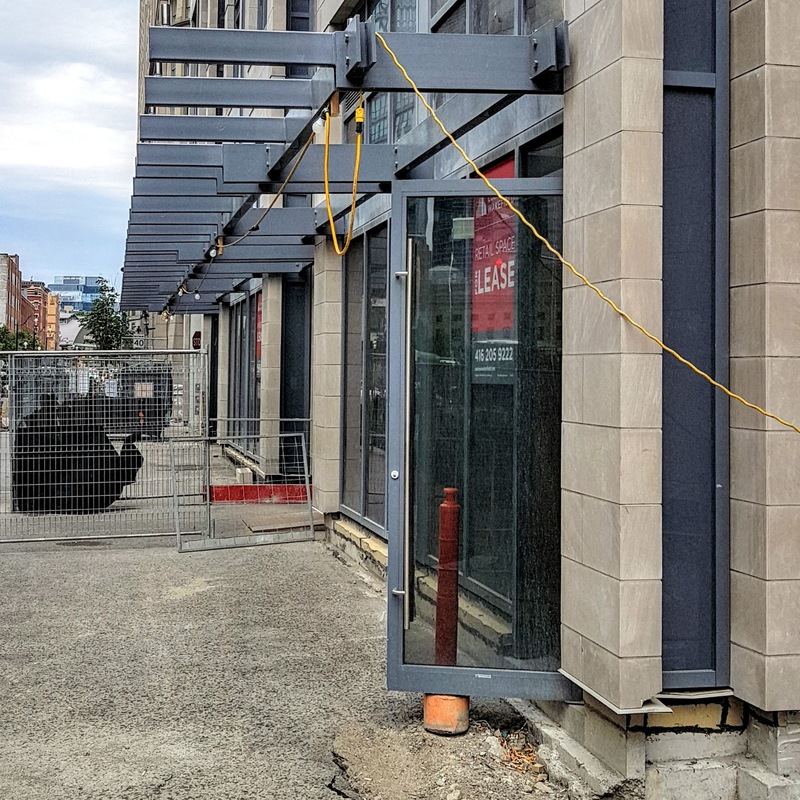 Work on the interior of the future PATH connection and Public Exhibit Space is well underway. Insulation and air ducts are being installed; drywall work will follow. 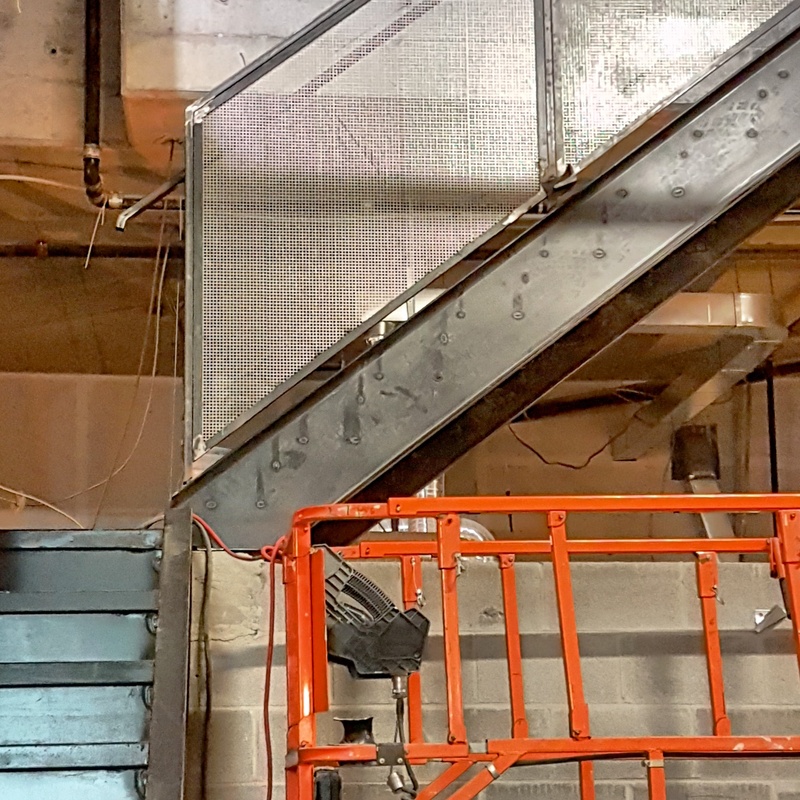 The stairwell that will connect the main floor of the public lobby to the PATH and Public Exhibit Space is also under construction. An elevator will also serve the PATH. Insulation and air ducts being installed in the interior PATH at Backstage. Stairwell under construction that will connect the main floor to the PATH and Public Exhibit space. Looking west from the outdoor amenity area at Backstage. Completed balconies and porcelain tiles on the east face of Backstage. Tiling on the outdoor pool is complete. Pool lighting fixtures have been installed. The first section of hard surface (concrete) has been completed on the podium deck. The second section is scheduled to be completed by the end of September. Landscaping and plantings will occupy the remaining portions of the outdoor amenity area. Stucco work on the eastern exterior of the podium deck has also been completed. Completed concrete and pool tiling on the outdoor amenity space at Backstage. Concrete surface finished on the eastern section of the outdoor amenity space at Backstage. Looking west along the south side of the podium deck at Backstage. 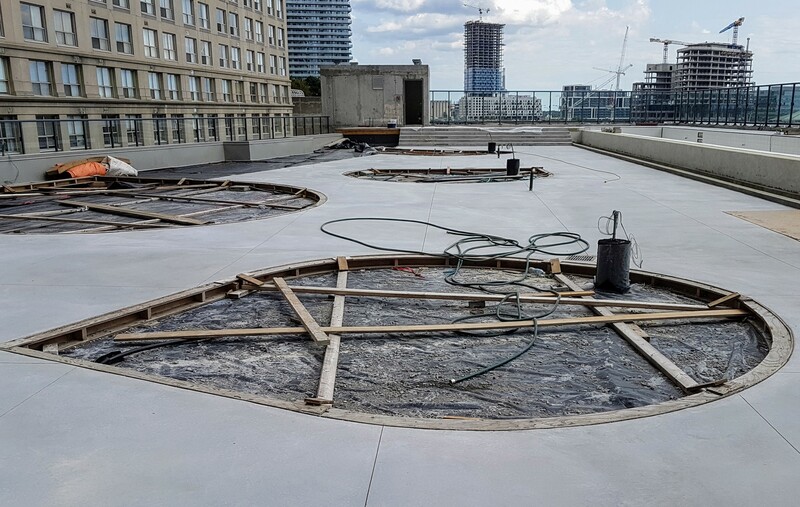 At grade waterproofing has been completed near the The Esplanade and Yonge Street. Concrete has been poured by the front entrance to the lobby. Further work on the adjacent sidewalk area will commence in the coming weeks. We will provide an update when information becomes available. Concrete poured at the front entrance to Backstage. 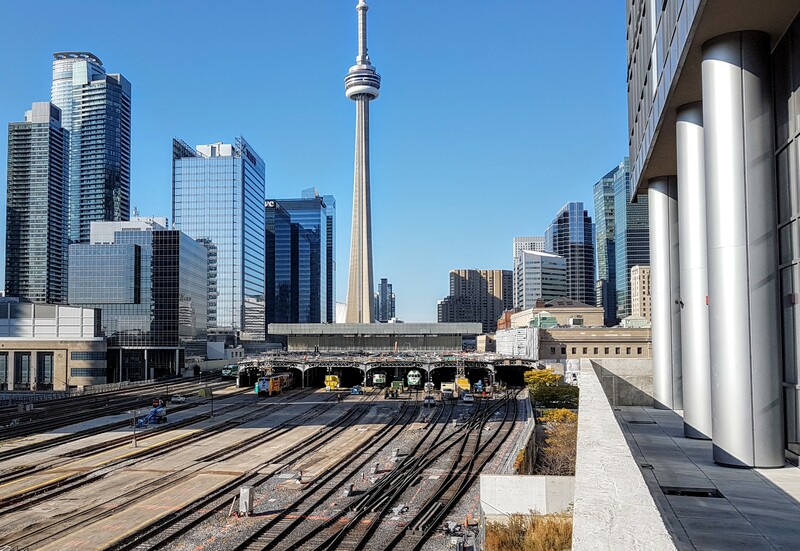 The future PATH connection will provide access to Union Station via the Yonge Street Railway Bridge. For the time being the bridge area has been cleared and is not in use as a construction staging area. Restoration of the bridge railing and concrete has been completed where it meets Backstage. The west face of the tower has been finished where it meets the bridge. 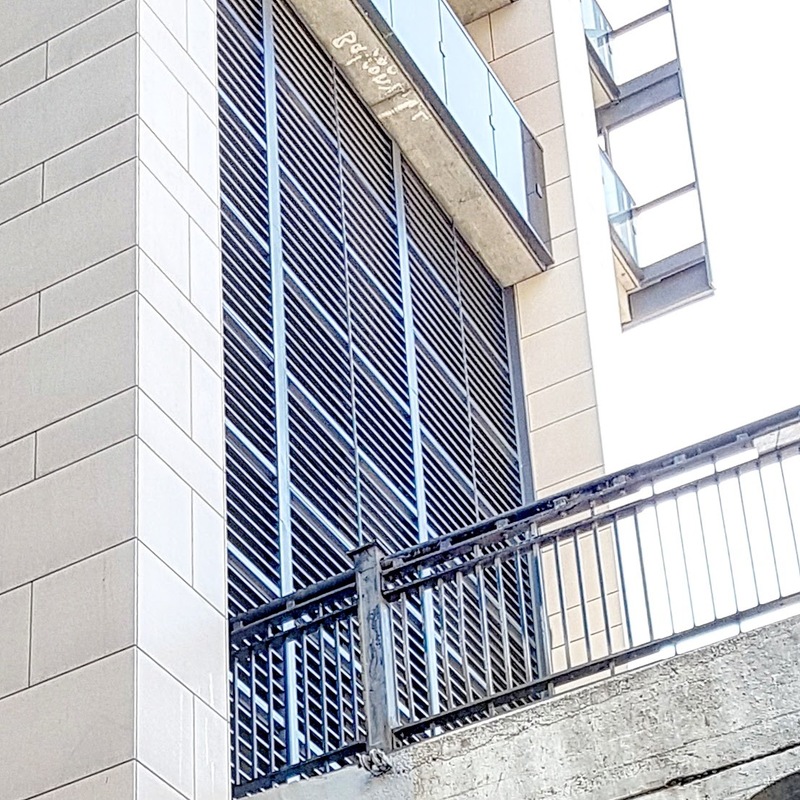 A knockout panel has been installed where the future PATH connection will connect at the second floor of the building. 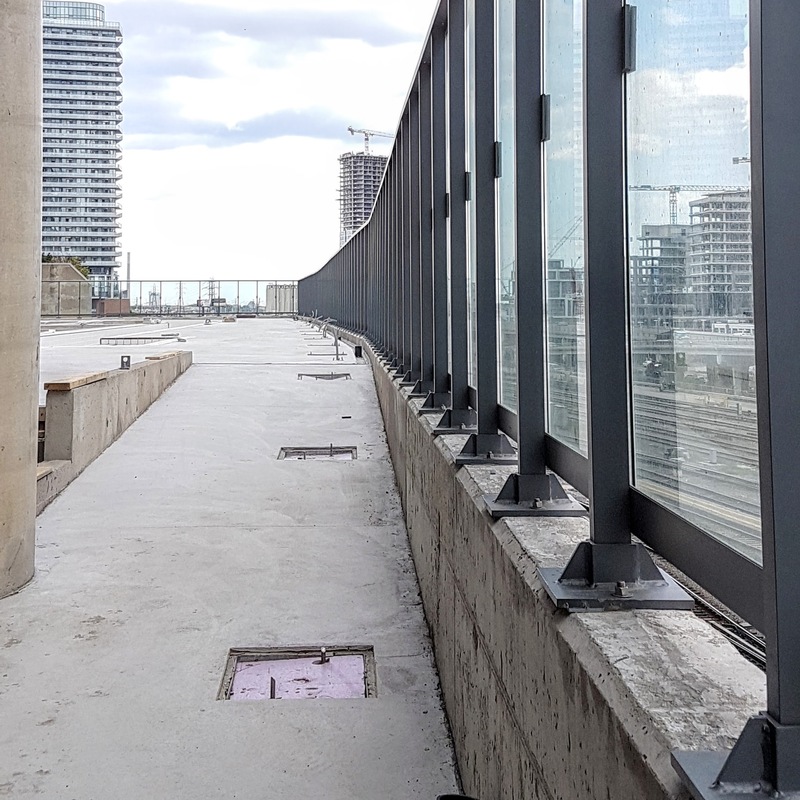 Restored railing and concrete on the Yonge Street Railway Bridge. 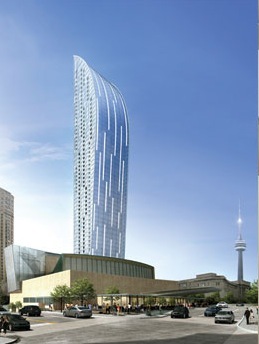 Finished exterior of the tower facing the Yonge Street Railway Bridge and future PATH. East face of the tower at Backstage. The first concrete pour on the podium deck has been completed. This hardscape surface now covers the eastern and southern sections of the outdoor amenity space. Railing and concrete decking on the south side of the podium at Backstage. Railing and concrete decking on the south side of the podium at Backstage, looking east. The second concrete pour is scheduled to occur after Labour Day. In the completed section, pictured below, the wooden framed areas are reserved for future plantings. Landscaping work, including the installation of plantings will begin once the final concrete pour is completed. Backstage podium deck concrete decking, wood-framed area for trees and plantings. 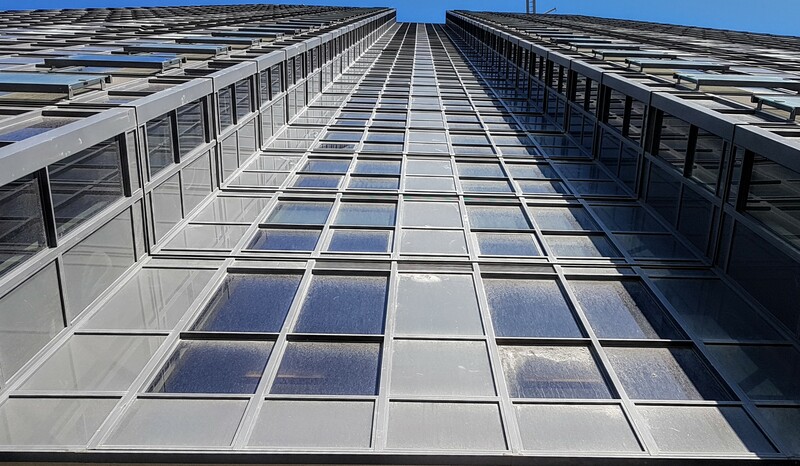 The porcelain tiling and balcony glazing on the east face of the tower are now completed. 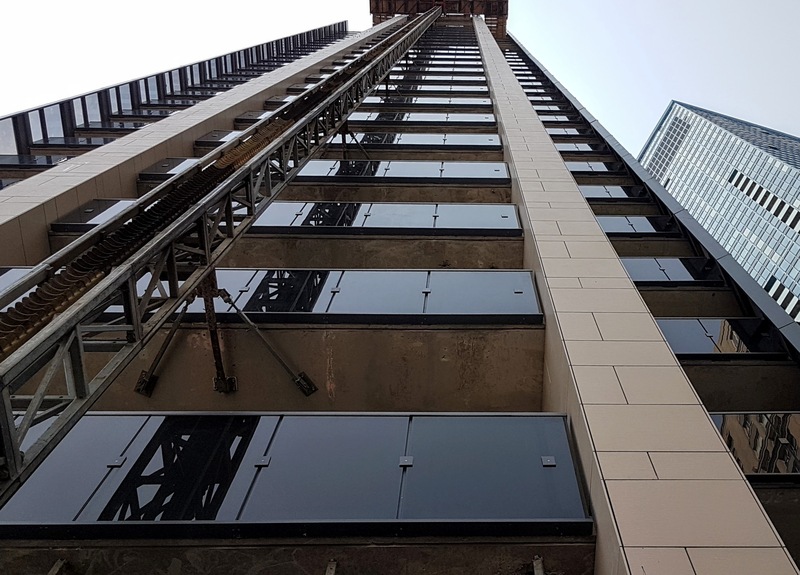 Completed balconies and porcelain tiling on the east face of the Backstage tower. 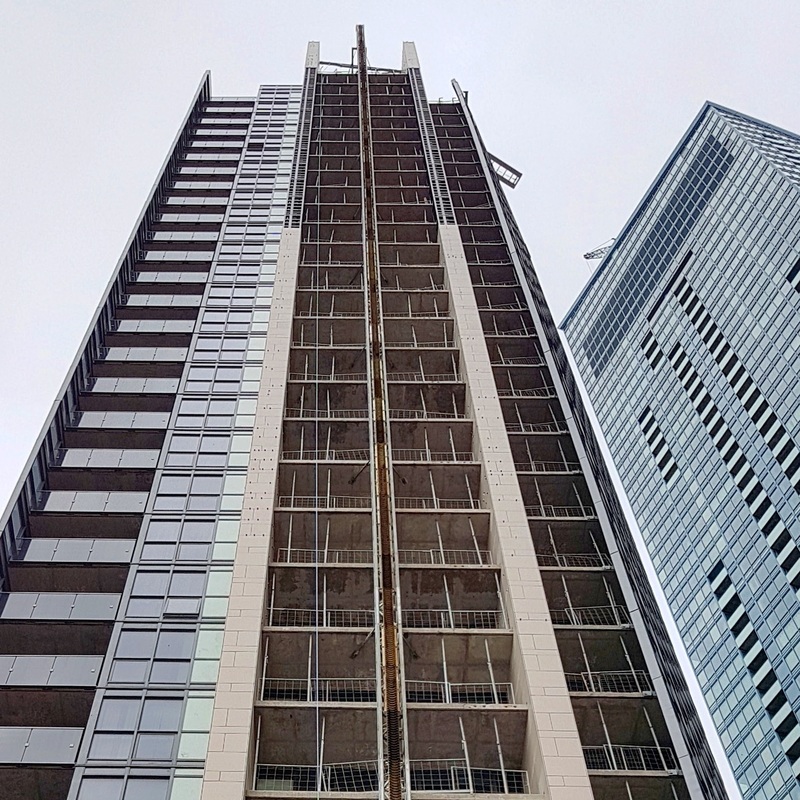 The external hoist (frackle) used to install porcelain tile on on the east face of the tower is being removed. It will be lowered to The Esplanade on the northeast side of the podium. 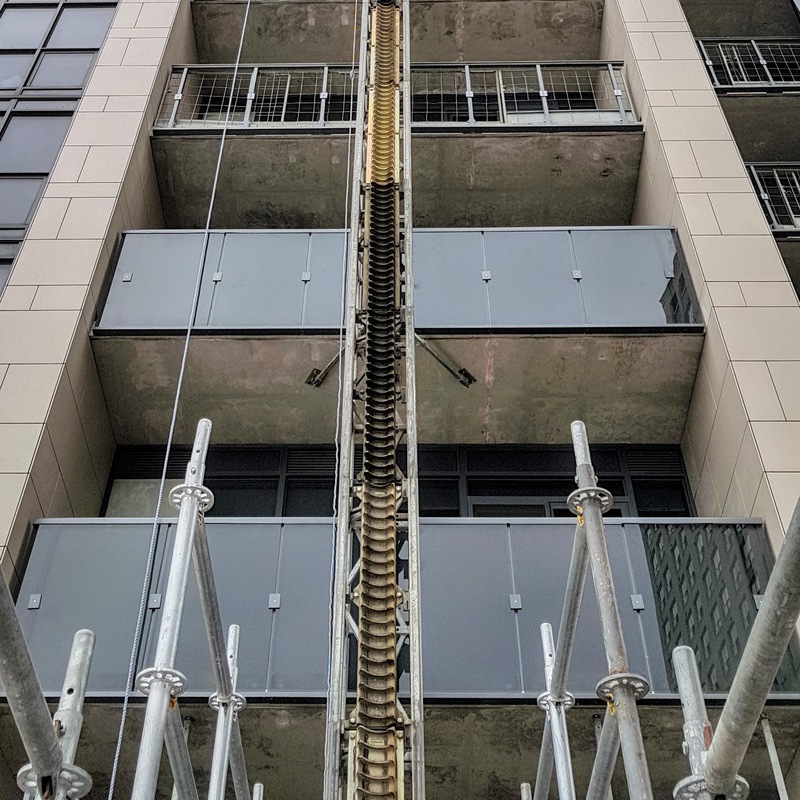 Frackle AKA the external hoist used to install porcelain tiles on the east face of the tower, that will be removed the week of August 28 – September 1. 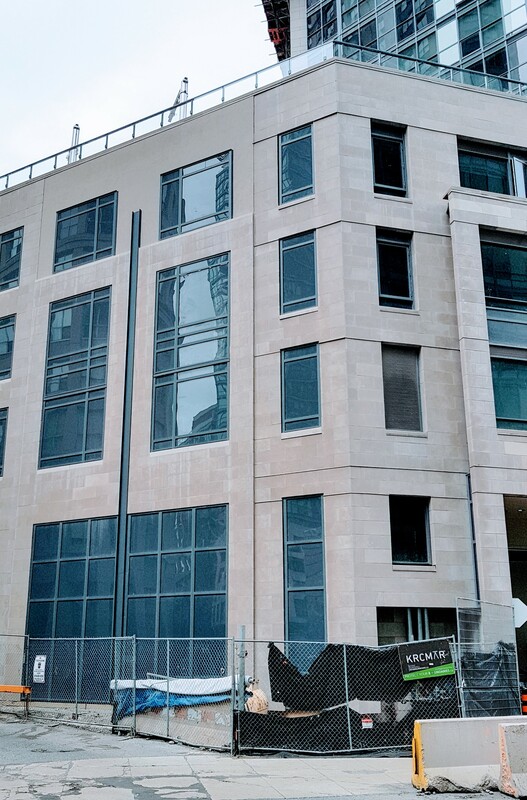 Exterior Work – East face of the podium. The concrete walls on the east face of the podium will be stuccoed in the coming weeks. An example of part of the area to be finished with stucco is pictured below. The east face of the podium will be stuccoed in the coming weeks. 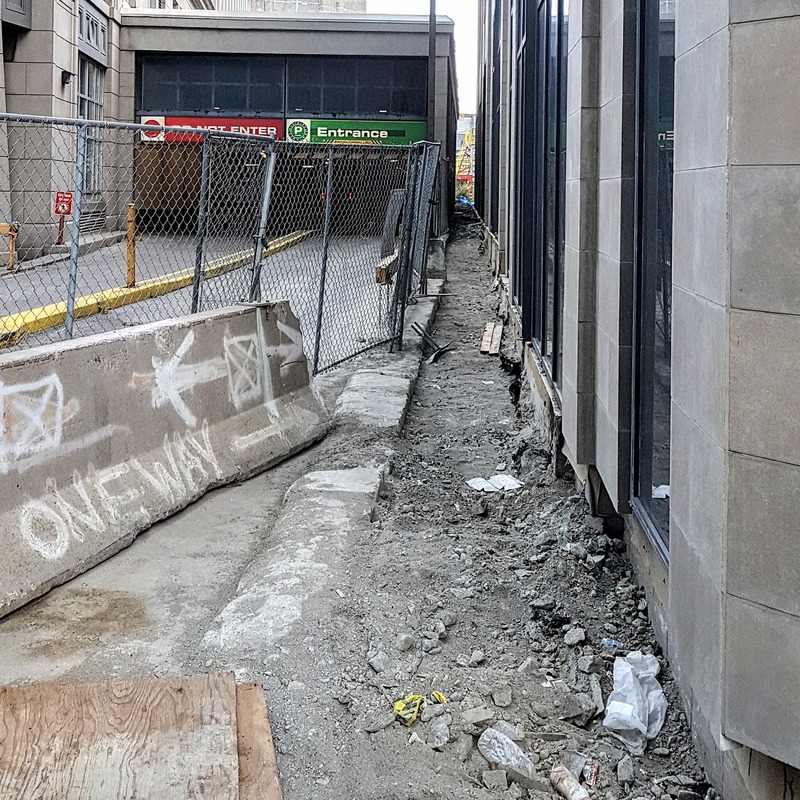 At the corner of Yonge and The Esplanade a trench was dug to permit waterproofing. Following the waterproofing the trench will be filled in. Preparations for the pouring of concrete and laying of paving stones will commence after this work is completed. 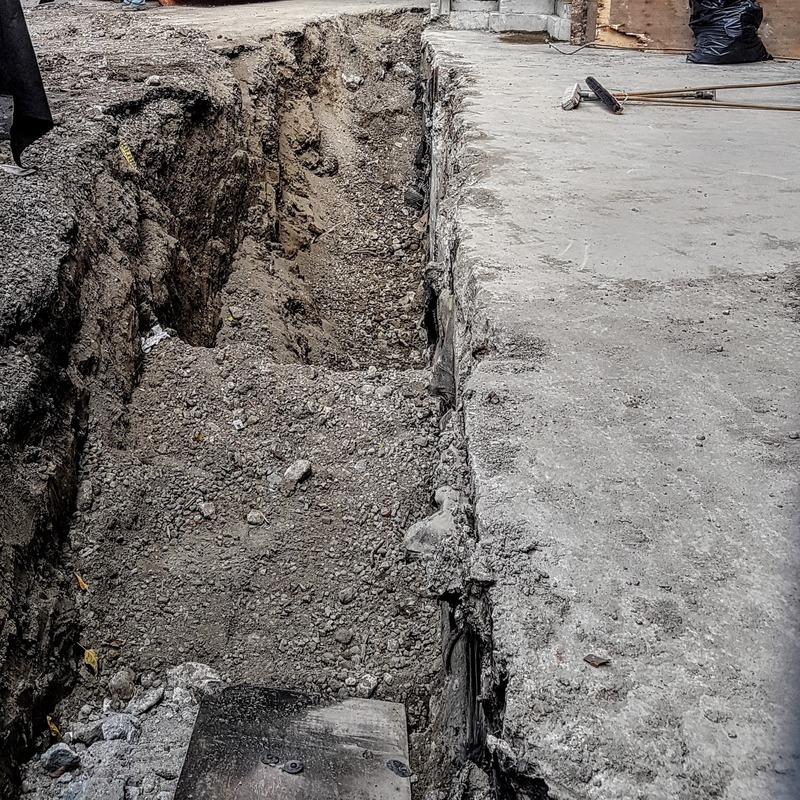 This section at grade just east of Yonge Street, will be waterproofed and filled prior to work commencing on concrete and paving installation. The canopy has been completed along the main face of the podium. Complete weather protection canopy at Backstage. The eastern edge of the podium will be cleared and finished in the coming weeks. The at grade edge of the east face of the podium will be cleaned and poured with concrete in the coming weeks. We will be continue to provide construction updates while work remains to be completed through the remainder of the summer. 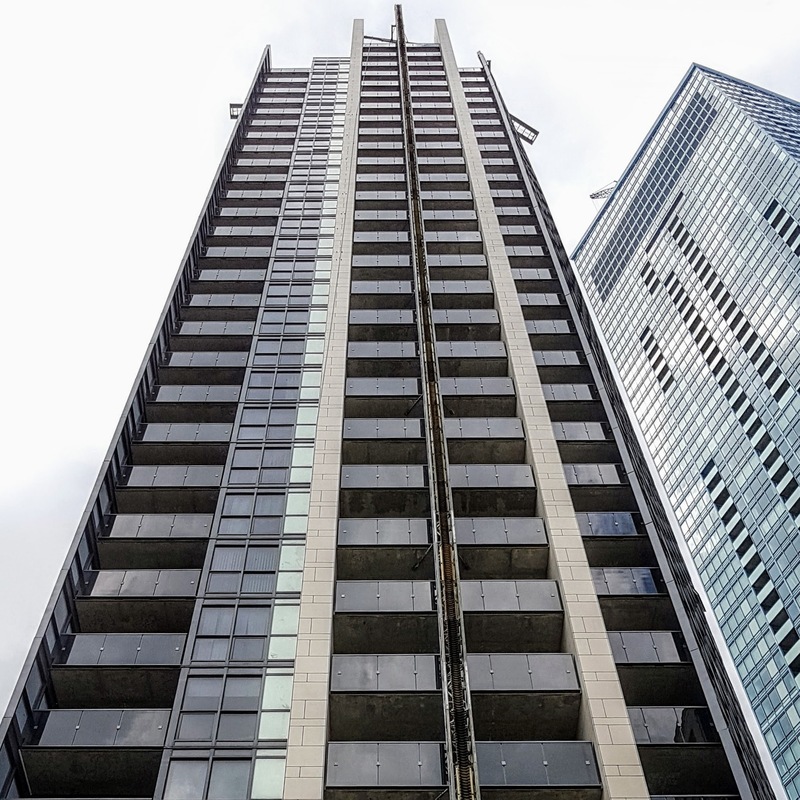 Please check back here at ltowerconstructioninfo.com for regular updates. 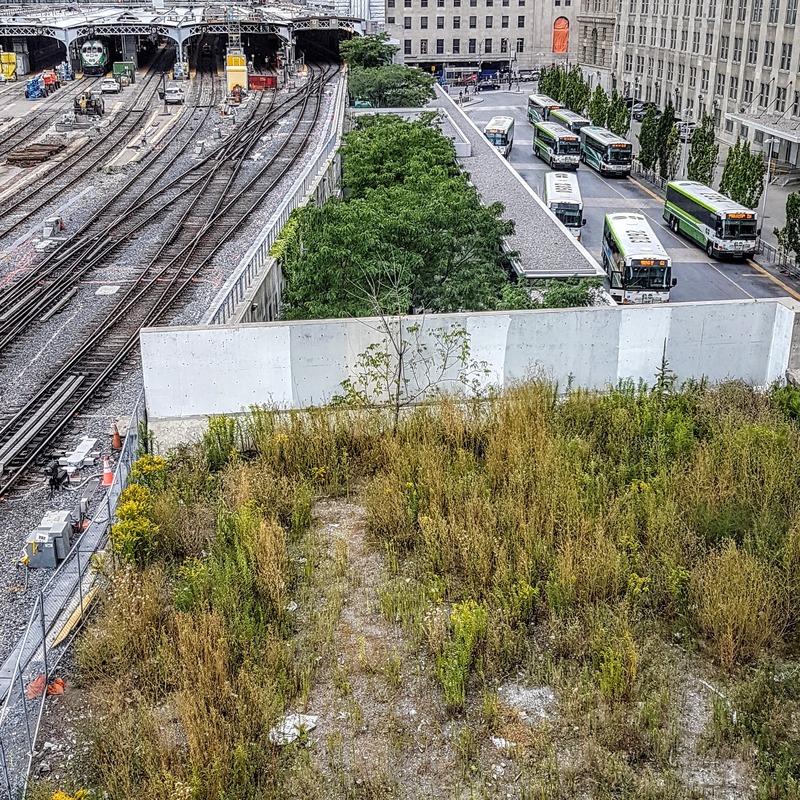 Looking down on the Yonge Street railway bridge section that will be the future PATH connection to Union Station. The podium deck concrete pour is scheduled for Tuesday, July 25. Concrete will be pumped from street level on the east side of the podium, adjacent to the Green P parking entrance. Paid Duty Police Officers will be on site to assist with traffic and pedestrian movement. It is expected that the concrete work will begin at approximately 8 am and be completed by or before 7 pm. Approximate location of concrete truck and pump for the podium deck concrete pour. Podium deck area to poured with concrete from a pump which will run up from street level. 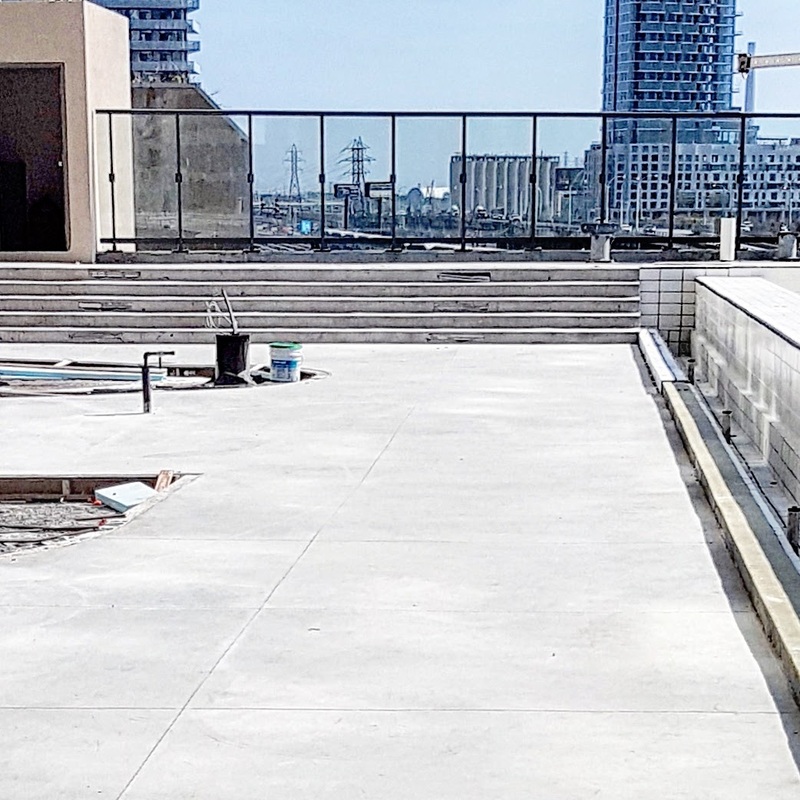 The concrete will be poured on the surface of the podium deck around the pool and the wooden forming that demarcates the areas where there will be plantings. Landscaping work, including the installation of plantings will begin in the coming weeks. 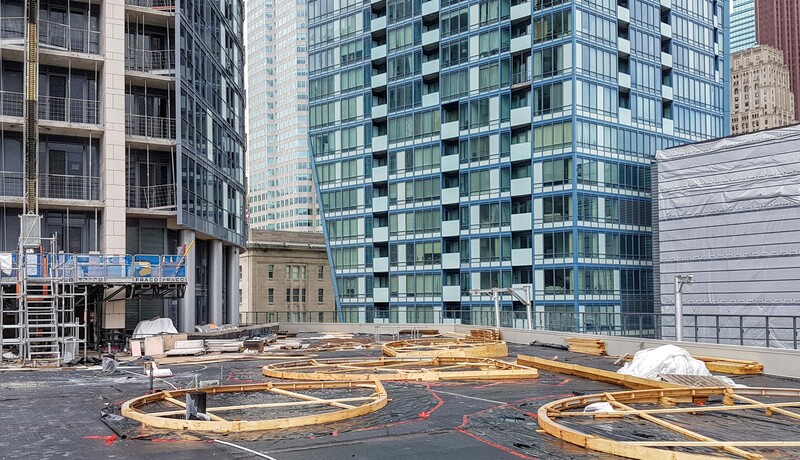 Podium deck at Backstage-soil & plantings will be placed within the wooden forms, the rest of the deck will poured with concrete. Work on the infinity pool is almost completed. 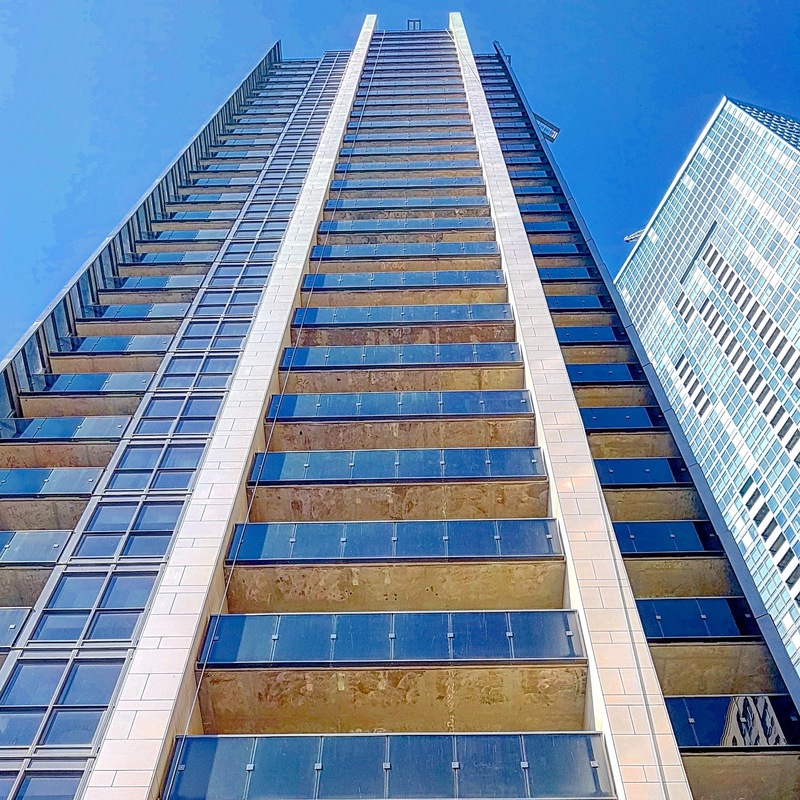 Balconies on the east face of the tower are being completed as is the final section of porcelain tiling. Tiled infinity lap pool at Backstage. 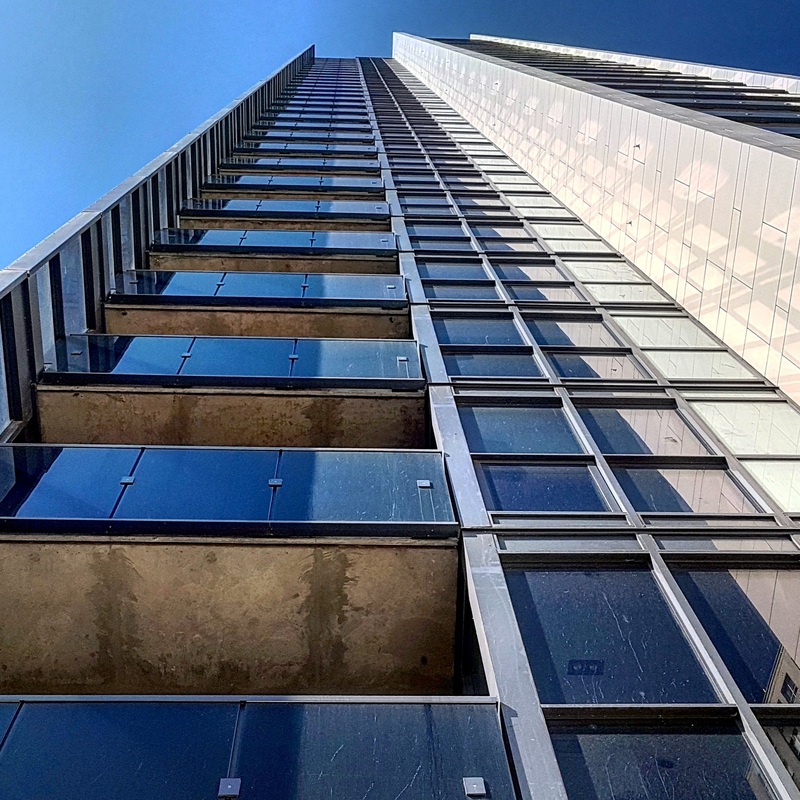 Completed balconies and porcelain tiling on the east face of the tower. 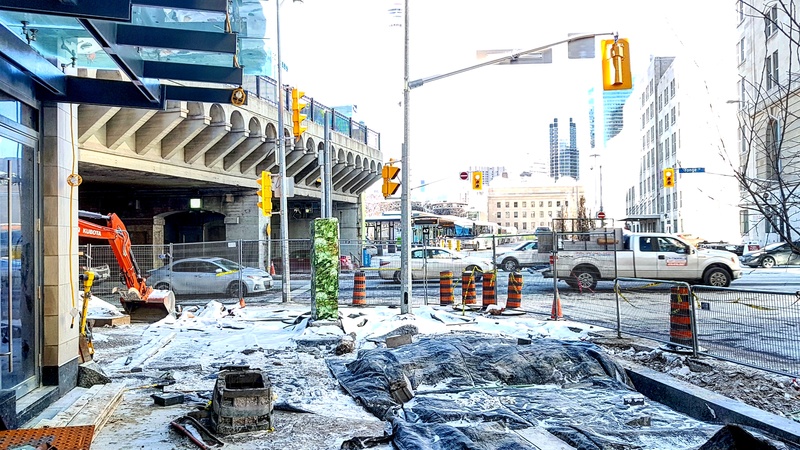 The Yonge Street railway bridge is being restored where it connects with Backstage. 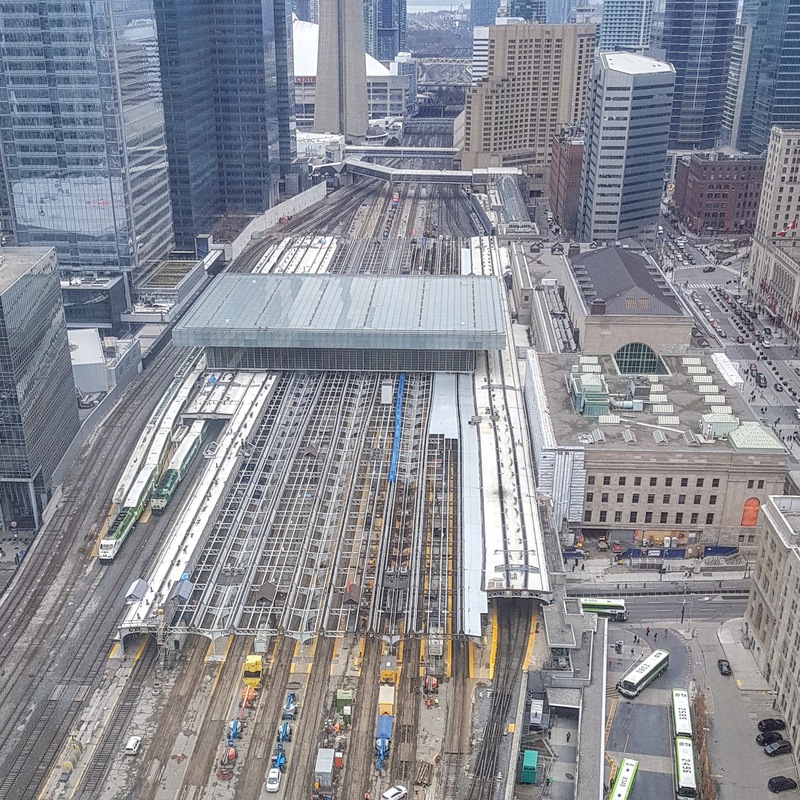 This bridge will provide a future PATH connection to Union Station, connecting to the 2nd floor public exhibit space and internal PATH area in the building. 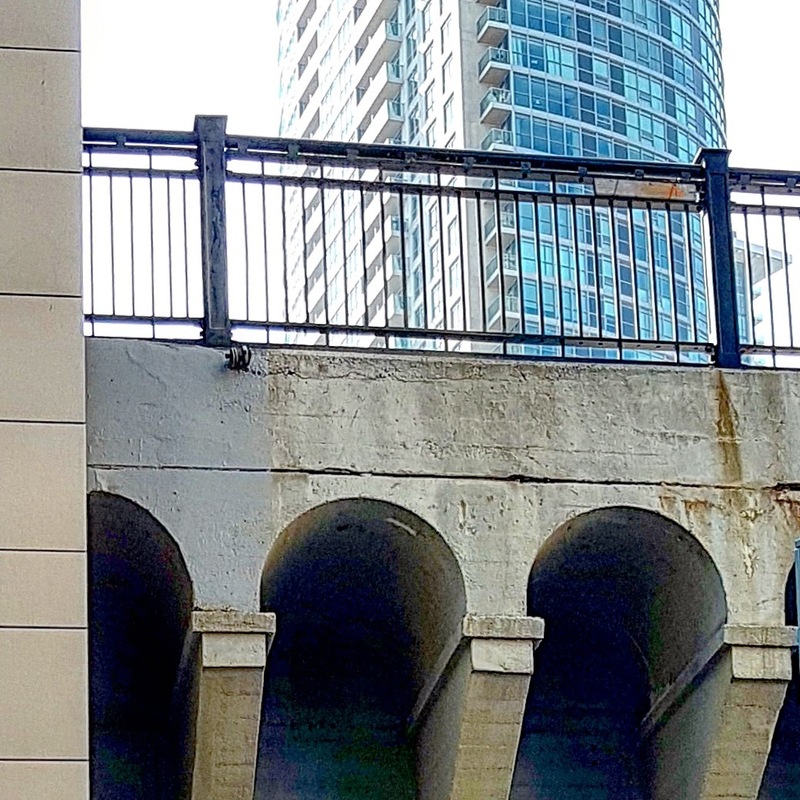 Restoration work in progress on the Yonge Street railway bridge. 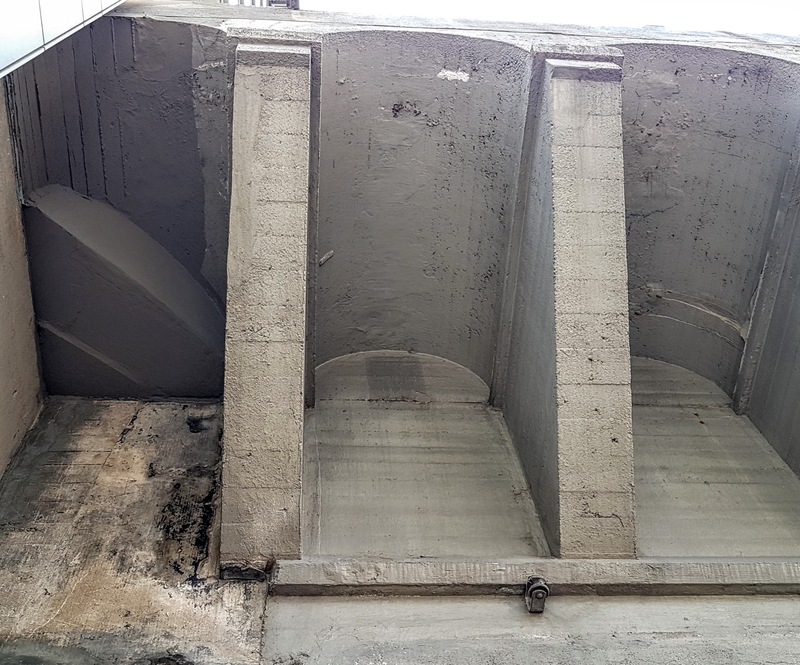 Restoration work on Yonge Street railway bridge (underside). 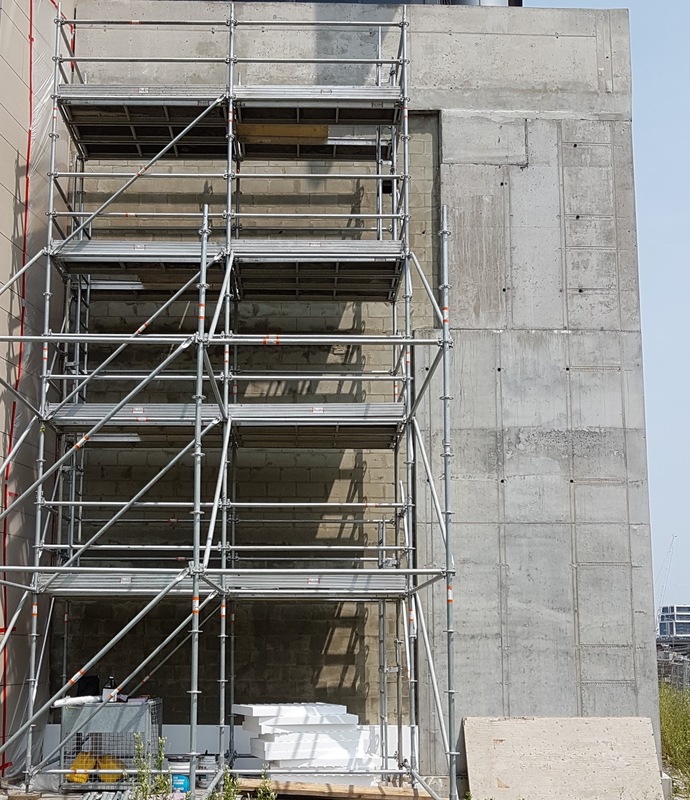 The concrete wall at the base of the west face of the tower will be stuccoed. As well the east facing wall on the eastern face of the podium. 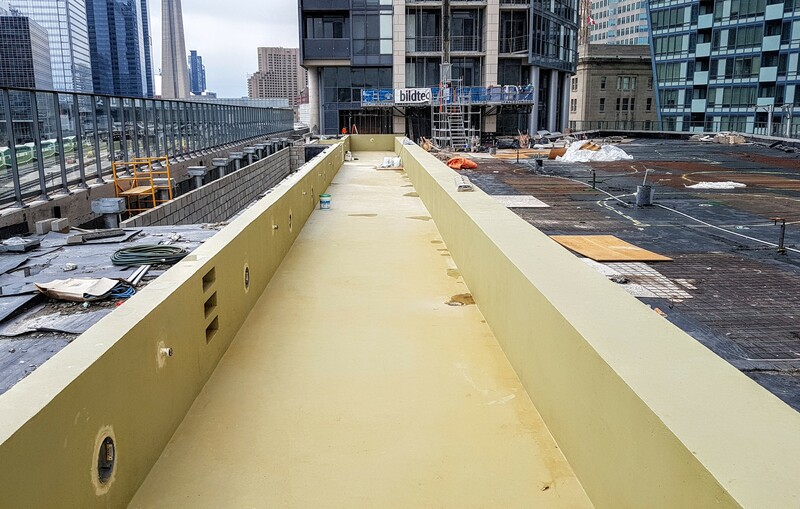 West facing wall from the Yonge St. Railway Bridge that will be finished with stucco. All the amenity areas has been completed and inspected. 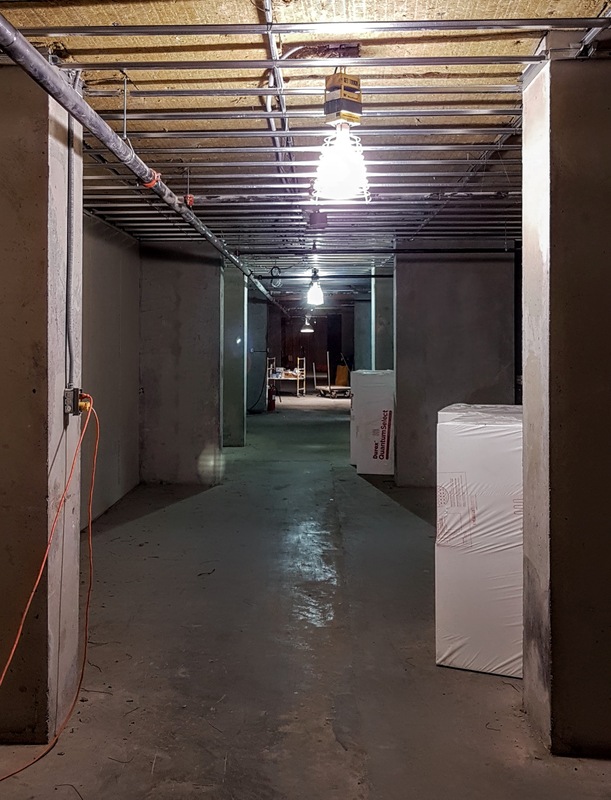 Work is progressing on the future public exhibit space and interior (future) PATH on the 2nd floor, with insulation installed on the ceiling areas, sprinkler systems and drywall being installed. Drywall underway in the future 2nd floor public exhibit space and PATH. Sprinkler systems, insulation and drywall under way in the future PATH on the 2nd floor of Backstage. 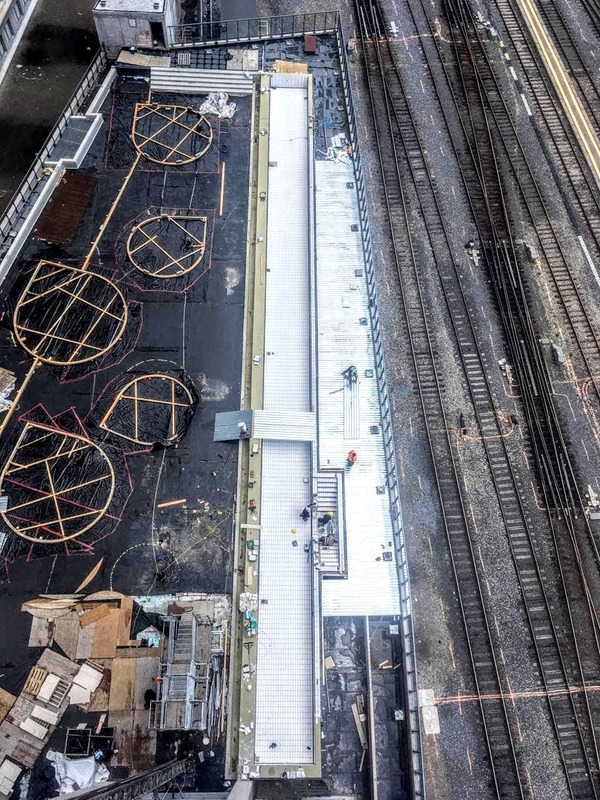 Looking down on the Backstage podium deck, showing wood framed areas for planting, the pool, and the areas that will be covered with a concrete hard surface. Work is proceeding steadily on the podium but is still dependent on co-operative weather. Tile installers closing in on completing their work on the infinity pool. 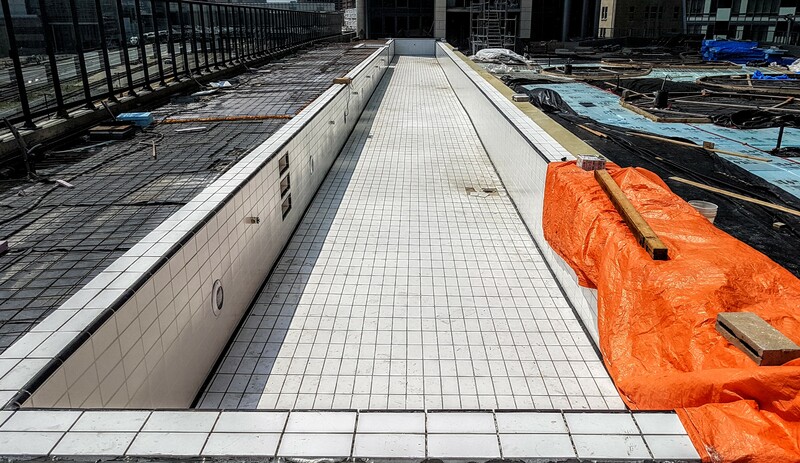 Swimming pool in progress on the outdoor amenity deck at Backstage. 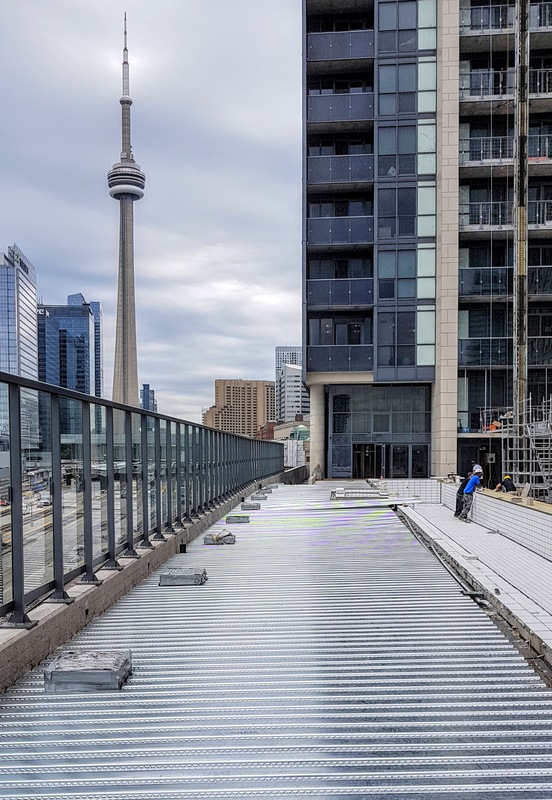 Toro Railing is installing balcony railings and glass on the central east facing units starting from the 6th floor and going up. There has temporarily delay on the installation of the porcelain tile because of a shortage of material. The material is coming from Spain and should be here in a couple of weeks. Balcony glass and railing installation in progress on the east face of Backstage. 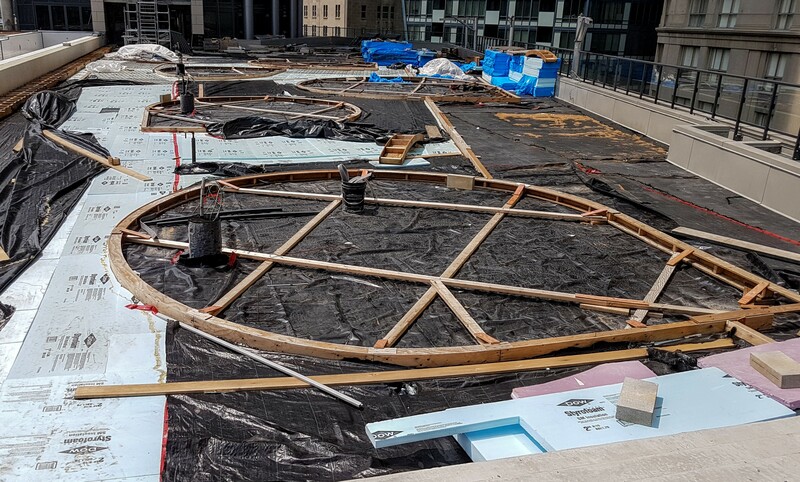 Installation of rigid insulation as a substrate for the concrete deck on the podium has been delivered and will installed next week, June 19th onward. 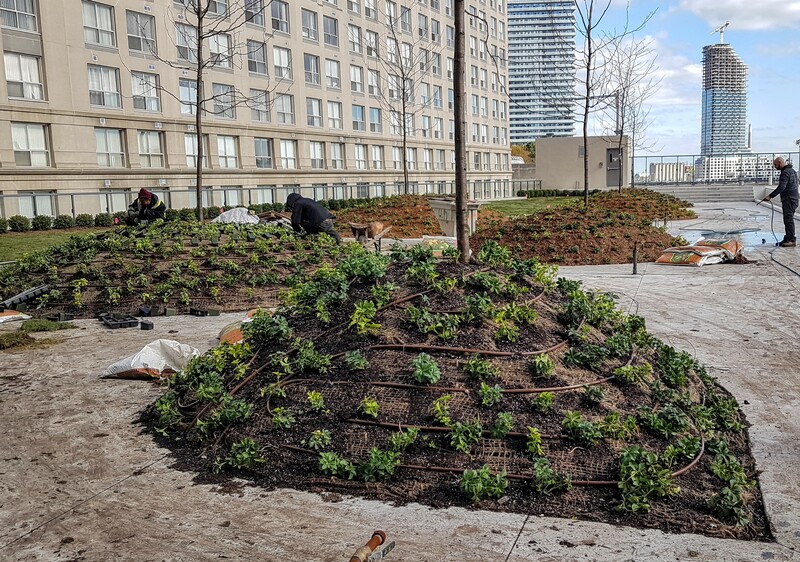 Plantation beds where trees and flowers will be planted have been formed on the podium deck. Area of the amenity deck where the concrete pump will be located when concrete work begins in early July. 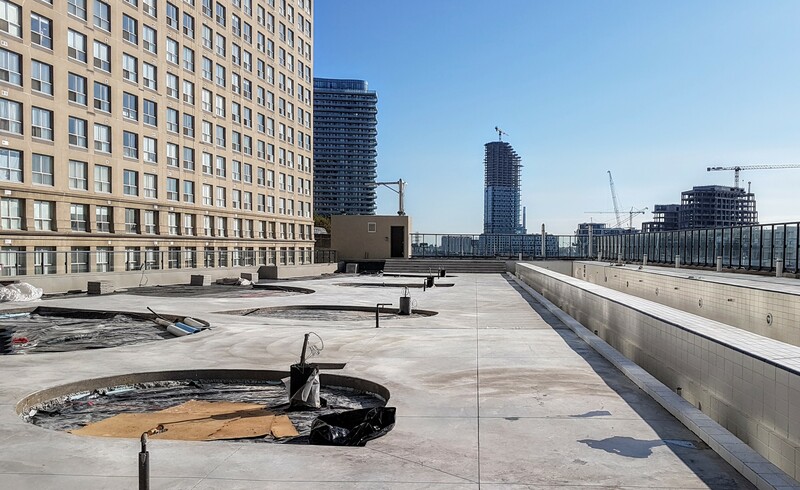 Once the insulation has been installed, concrete will be pumped from street level and finished to form a hard surface for the outdoor amenity deck. Backstage south side of the outdoor amenity area, that will be prepped for concrete decking. Construction management is finalize the landscape permits and planning before proceeding on finishing the sidewalk areas at street level. This work is expected to get underway in July. Sidewalk work is expected to get underway in July. 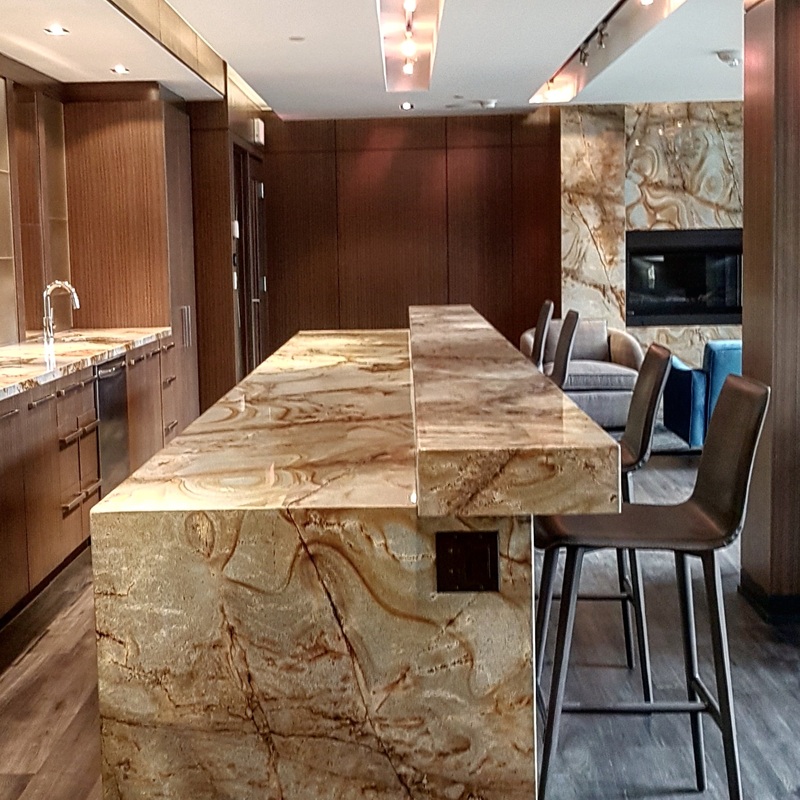 All of the furniture for the amenity areas has been delivered and installed. 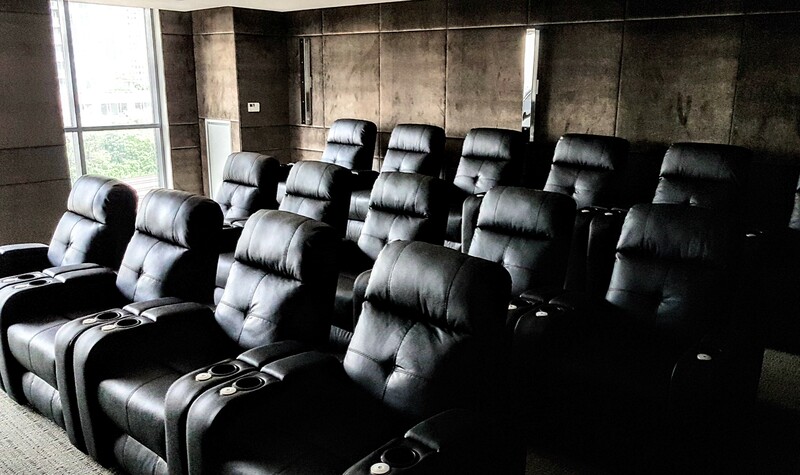 The reclining chairs have also been installed in the theatre. 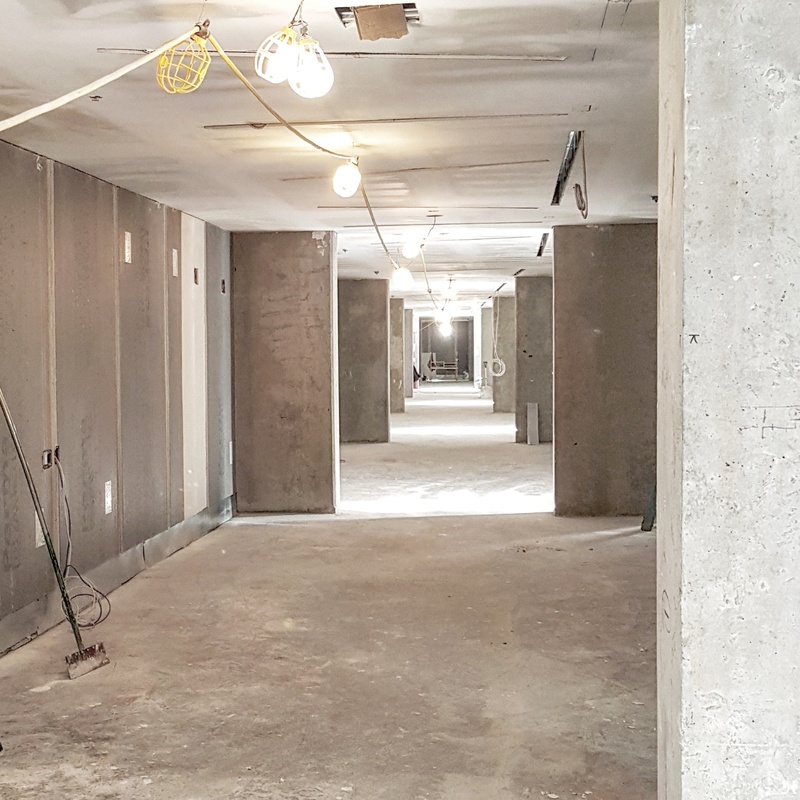 Mirrors are being completed in the 5th, 6th and 7th floor amenity areas and the contractor is now gearing up to install the ground floor lobby mirrors. 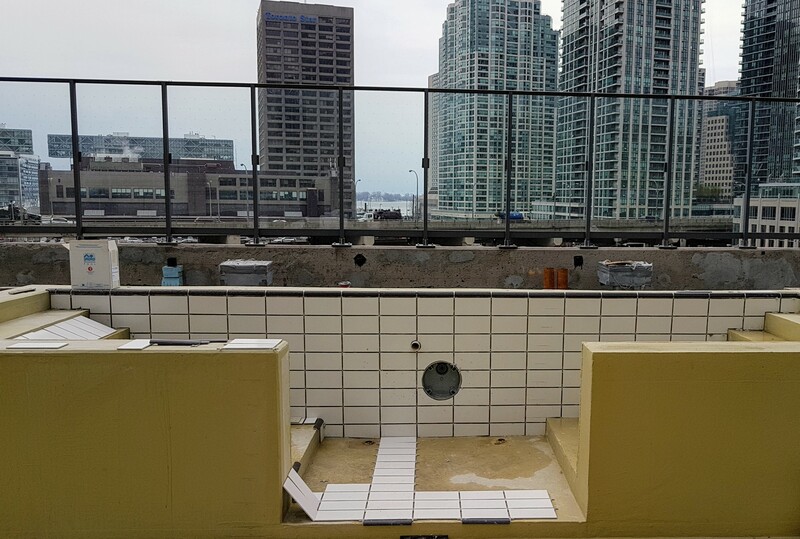 Work on the 5th floor jacuzzi room, adjacent to the outdoor pool, is also nearing completion. The construction management team hopes to have everything done by the end of June. Finished and furnished video room, amenity space, at Backstage. 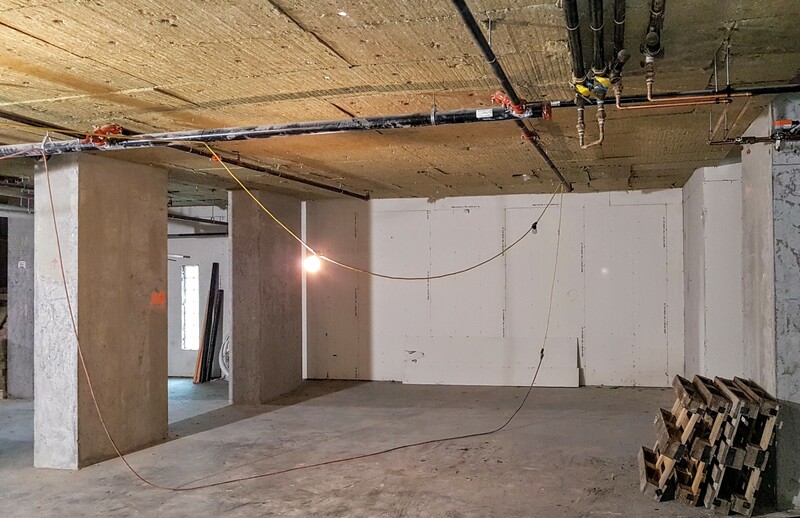 Initial work is also beginning on the future public exhibit space and interior (future) PATH on the 2nd floor, with insulation installed on the ceiling areas. Part of the future public exhibit space and PATH on the 2nd floor of Backstage. 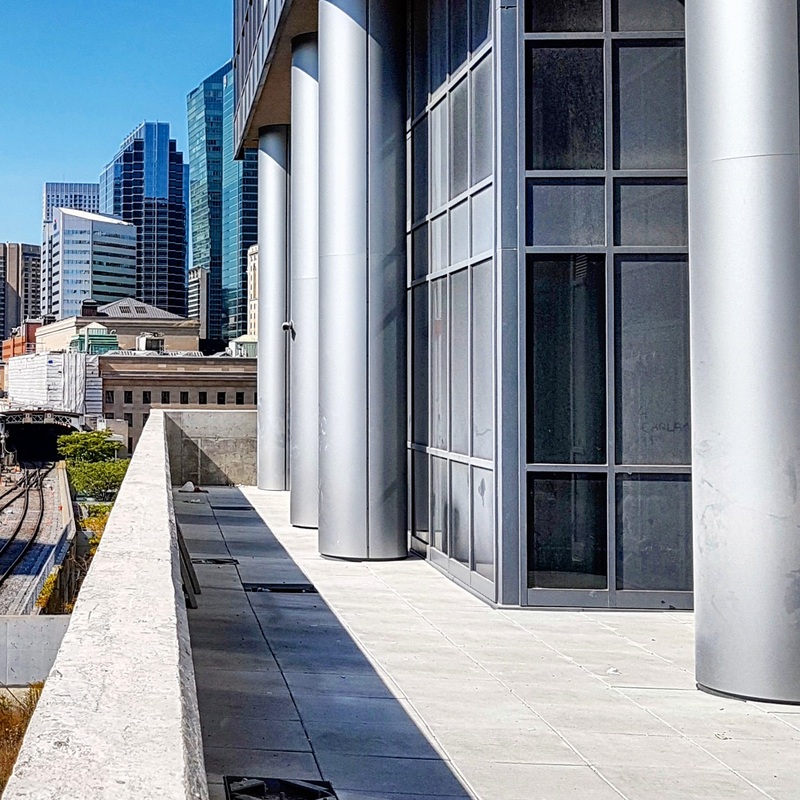 Backstage & the L Tower June 15, 2017, viewed from the Yonge Street Rail Bridge. 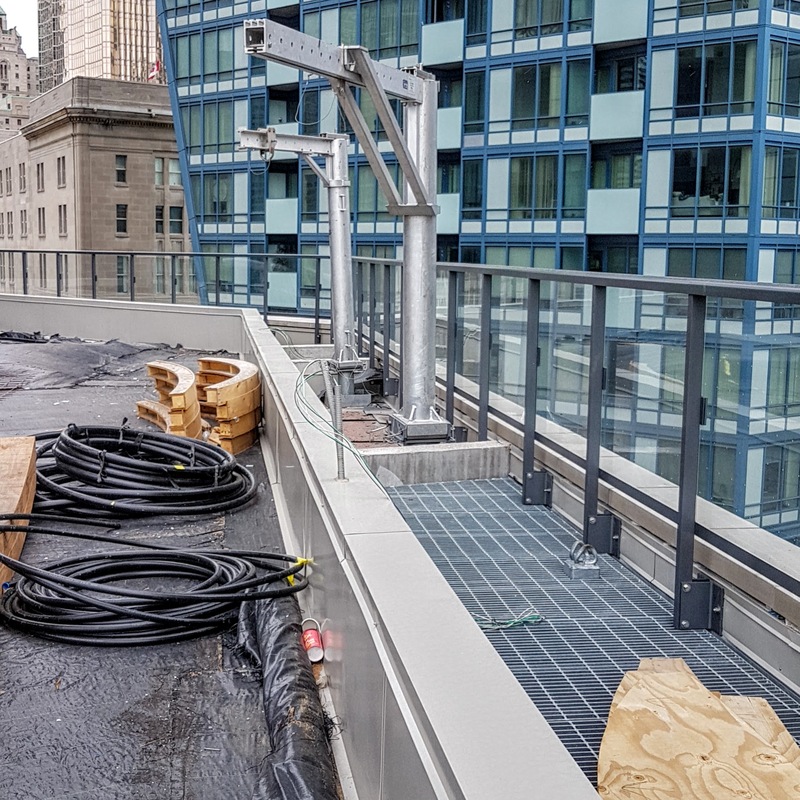 The external hoist that was used to install the porcelain tile on the west side of the tower is being removed. A mobile crane is being used to left sections down to a flatbed trailer. 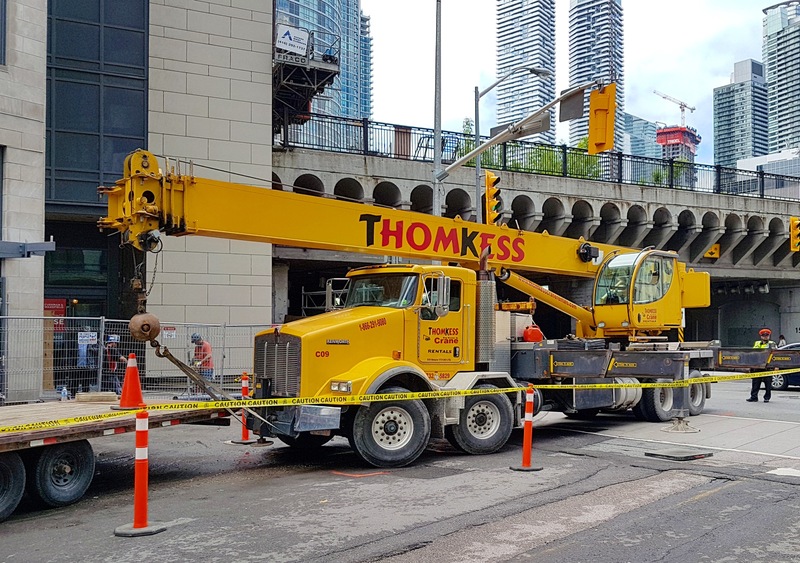 The crane parks on the south side of The Esplanade just east of Yonge and a paid duty police officer is on-site to monitor and ensure traffic and pedestrian safety. It is expected that this work will be completed by May 29 or 30, weather permitting. Mobile crane setting up to remove a section of the external hoist. 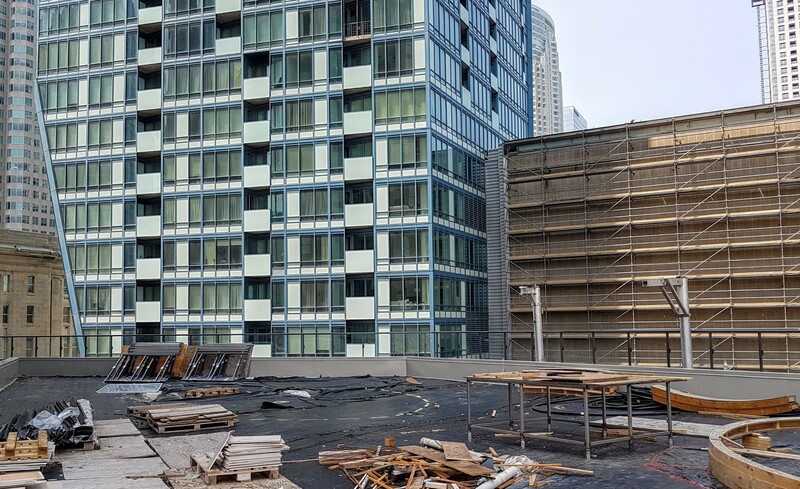 The installation of the porcelain tile is continuing above the 20th floor on the east side of the tower. 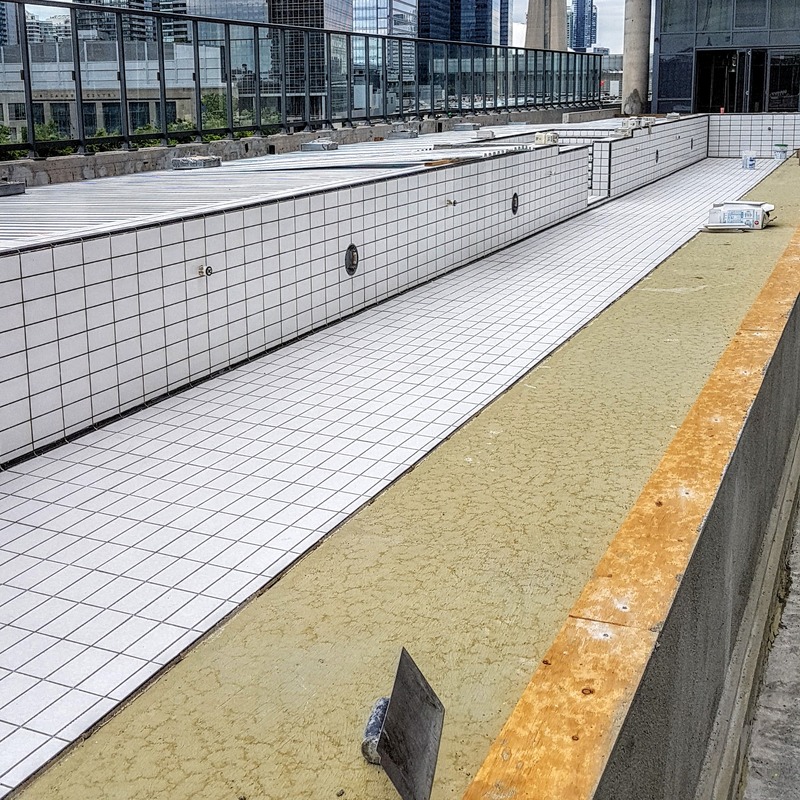 Installation of the tile for the pool on the podium’s outdoor amenity area is mostly complete. Landscapers have started to form the bulkheads for the concrete which will surround the tree mounds on the podium. 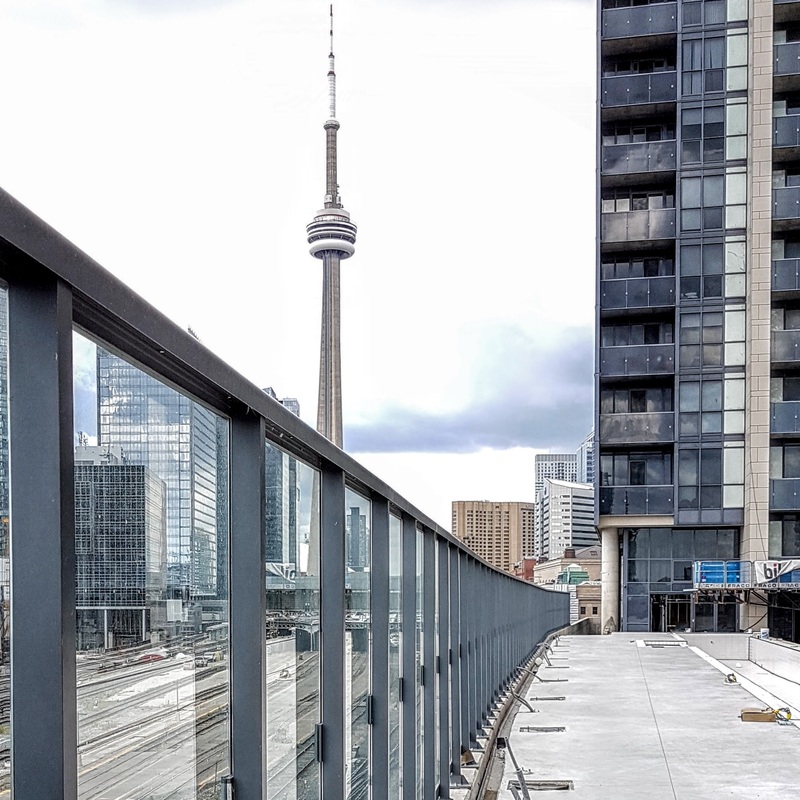 The podium deck railing has been completed. 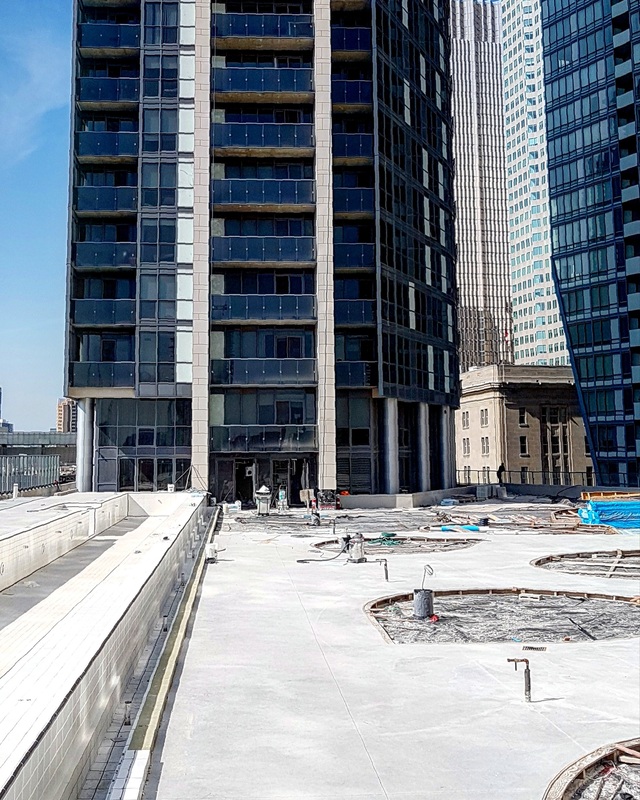 Construction management is continuing to work with their landscape contractor to plan and schedule the finishes for the podium deck. 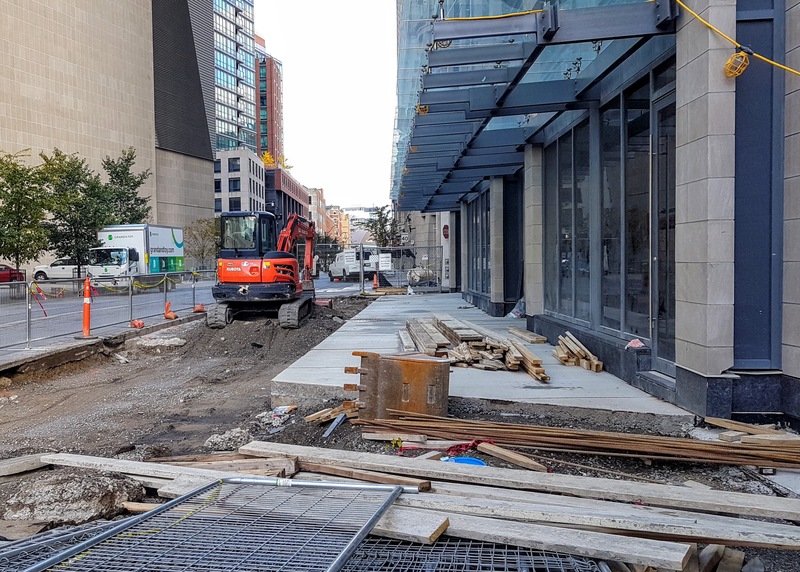 They are still working with the City of Toronto to finalize the landscape permit before proceeding on finishing the sidewalk and exterior at street level. The finishes in that area for the indoor whirlpool spa area will commence in the near future. Installation of mirrors in the amenity areas is ongoing. The furniture for the guest suites, administration office, bar lounge on the 6th floor has been delivered. 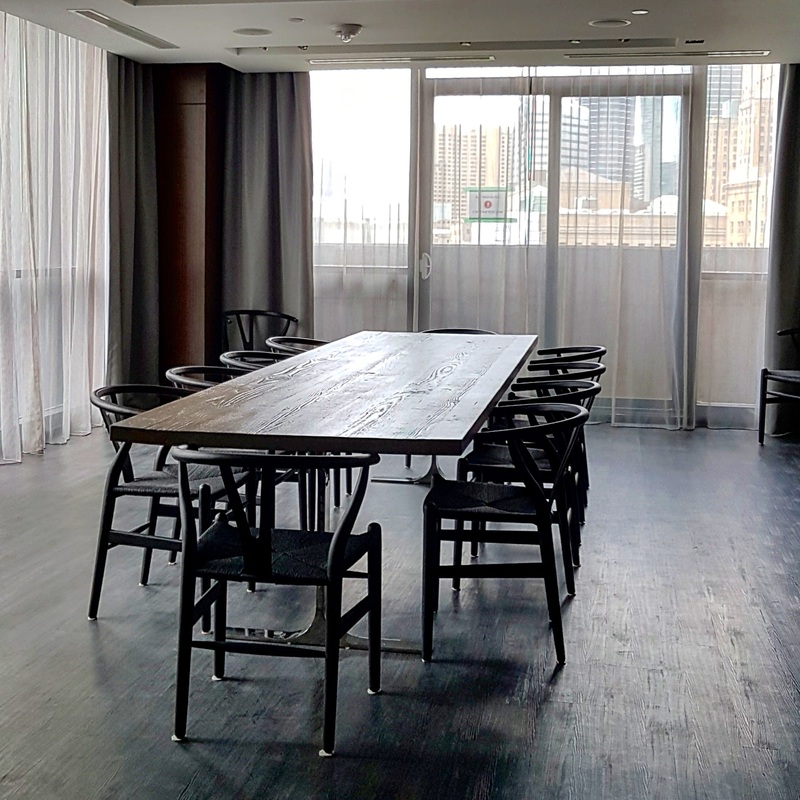 The furniture for the party room and private dining area has also been delivered and put in place. We will be continue to provide construction updates while work remains to be completed through the remainder of the spring and summer. 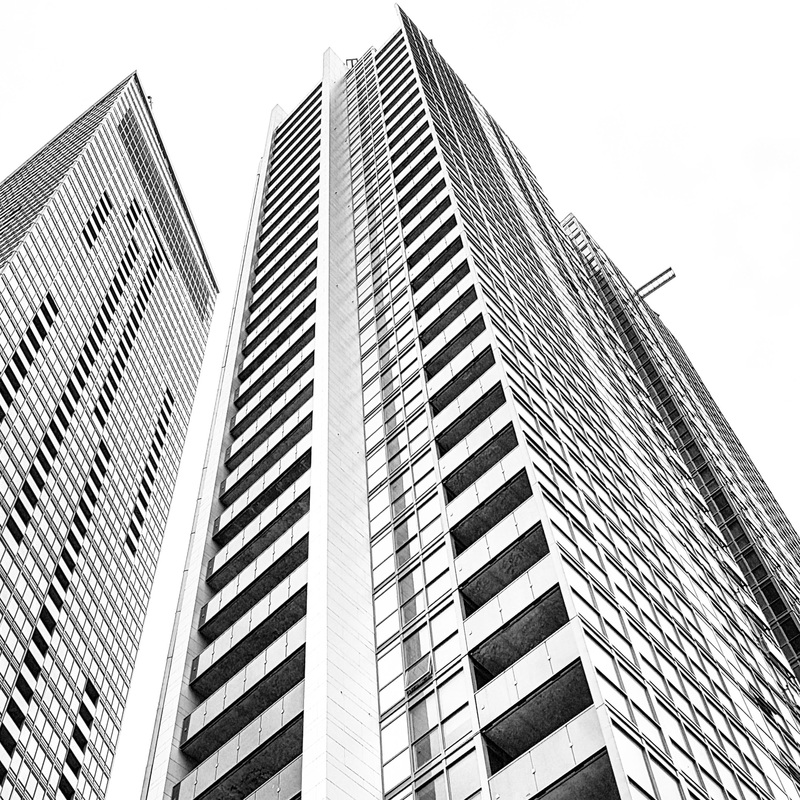 Please check back here at ltowerconstructioninfo.com for regular updates. Work on the podium is being ramped up now that the nice weather is finally here. The porcelain tile is being installed on the east ‘fins’ of the tower. The tiling of outdoor swimming pool has begun and will continue through the coming week or more, weather permitting. 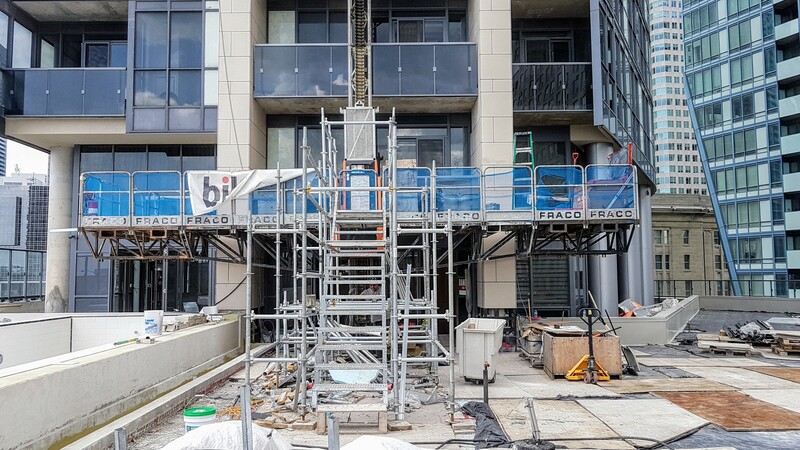 Work is starting on some of the block work on the south end of the podium which will be supporting the concrete deck along the backside of the pool. 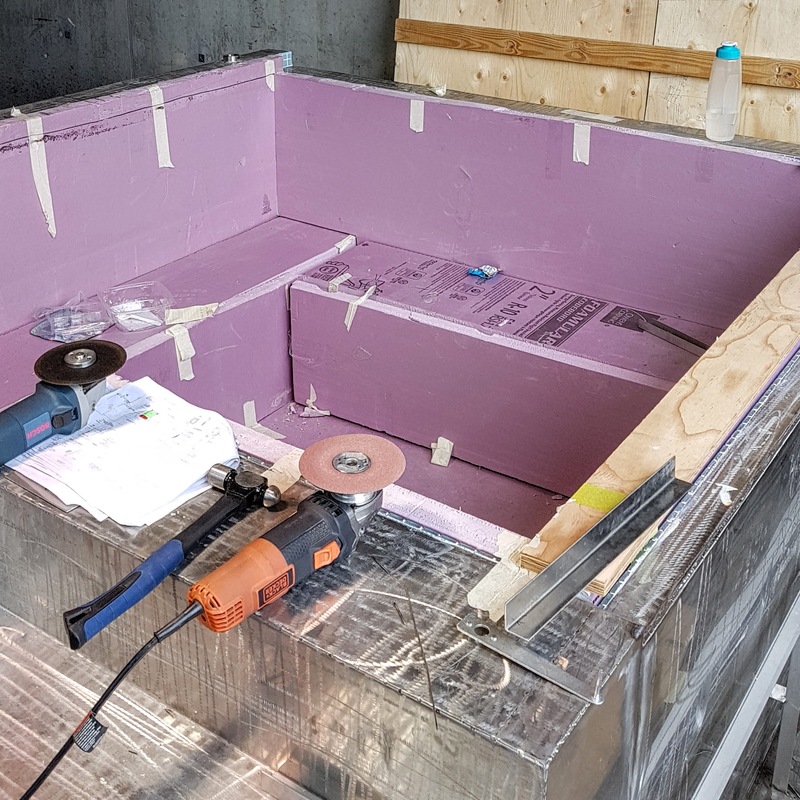 Delivery of the pre-finished whirlpool has been made and it is being installed this week, with finishing continuing through the next week. 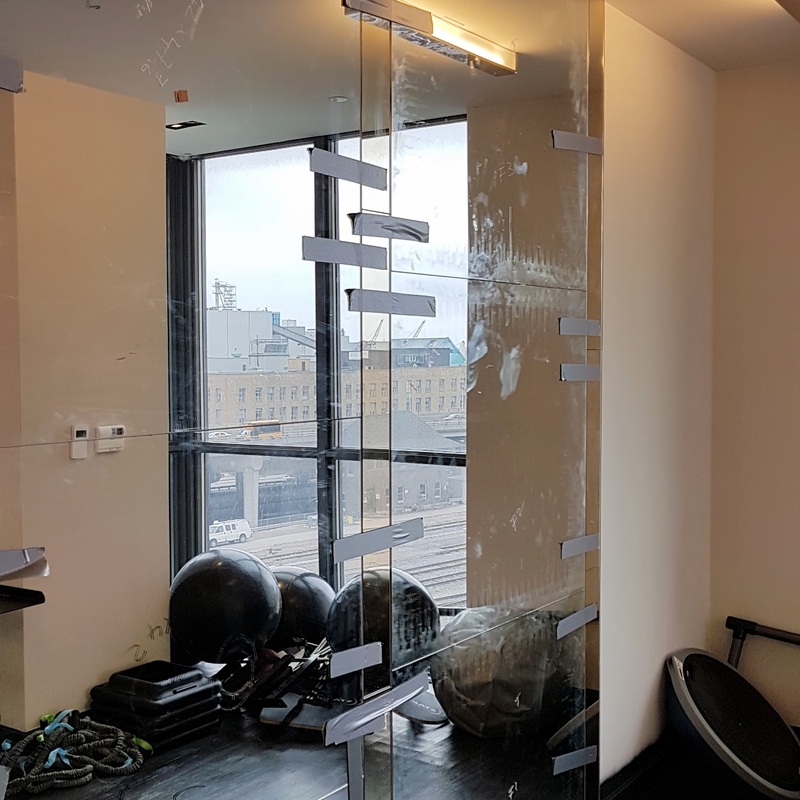 The first order of mirrors have been installed in the fitness/yoga areas, with the more coming soon. Furniture for the amenity areas will arrive the first week of May. We will be continue to provide construction updates while work remains to be completed through the remainder of the spring. 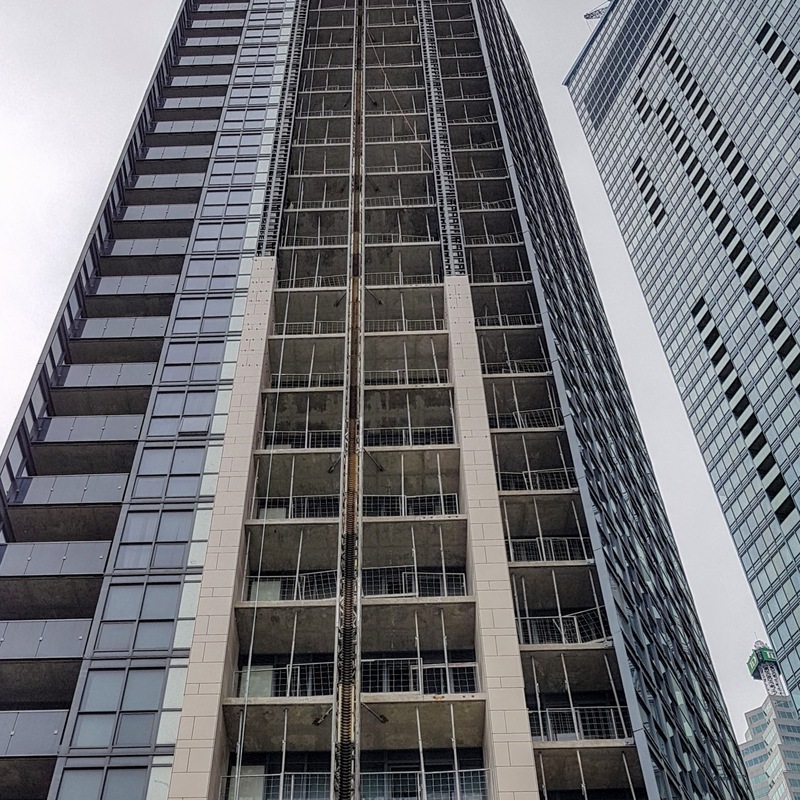 Please check back here at ltowerconstructioninfo.com for regular updates.